Summer gets under way. May days and warm June nights - I'm starting with quick tour of Bath one of the UK's ancient fashion capitals, before diving into a summer of fashion reports. 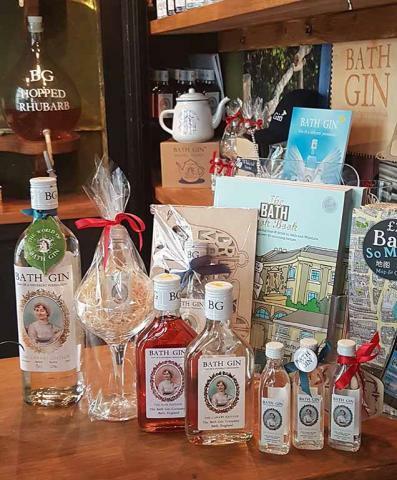 The city of Bath celebrates some milestones this year and it's shopping, Spa and Food scene is a cultural feast for the senses. Bath is an ancient city home to highly cultured British tribes, the Romano-British and later colonised by the fashionable people of the Georgian and Victorian era. 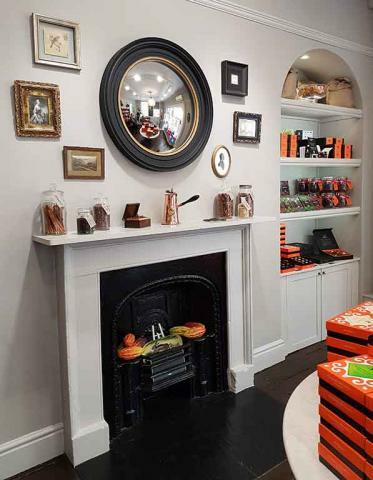 Beneath it's warm Somerset stones is a history of style and taste making that had broad social impact across the world. 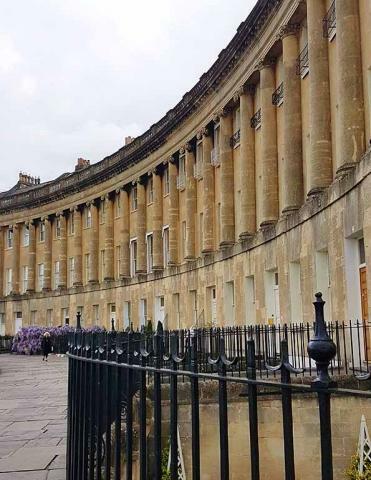 As a UNESCO World Heritage site with the 250th anniversary of the Royal Crescent coming up and the passing of former celebrated resident author Jane Austen 200 years ago, I was delighted to be asked by Visit Bath to come and see what the town has to offer this Summer. 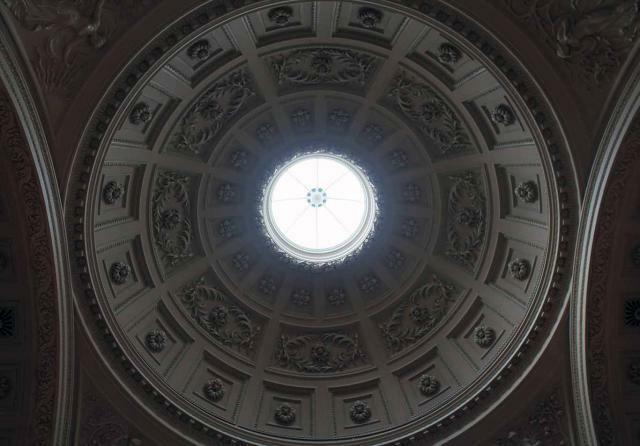 All images shot by myself in this piece unless indicated - Bath's Georgian architecture. The mesmerising beauty of the Circus. The trees on the green of the Circus. 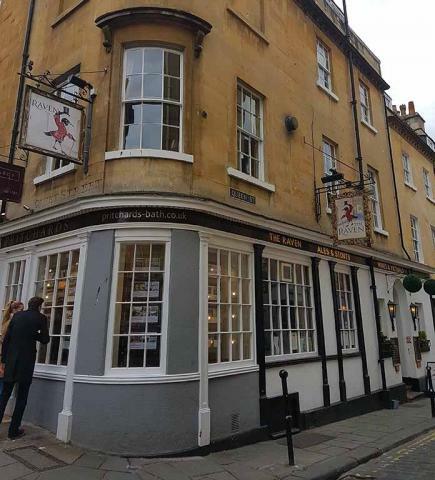 Bath's architecture today owes most of it's identity to the time when Bath was a fashion and social hub for landed families from all over UK and Ireland and also many merchants from the Commonwealth and India. In this milieu social commentators and author's, such as Jane Austen found plentiful inspiration for colourful characters. Amongst the mix where even some Cliffe's, I hoped they behaved themselves! They didn't turn up as dubious characters in a Regency era novel anyway, so maybe I'm safe. To the right above are some images of the famous Circus that I took on the way to the fashion museum. Fun fact: finished in 1768 it is actually shaped to the same proportions as Stone Henge. Another blend of the ancient with more recent history. 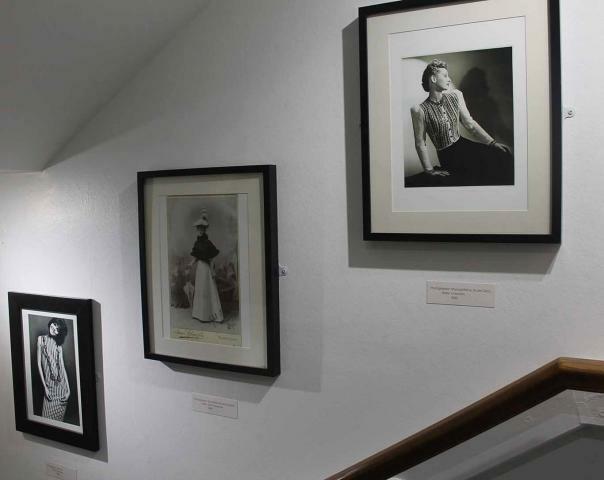 Bath's Museum of Fashion is world famous and forms the centre piece of events that draw key industry figures from across the world. 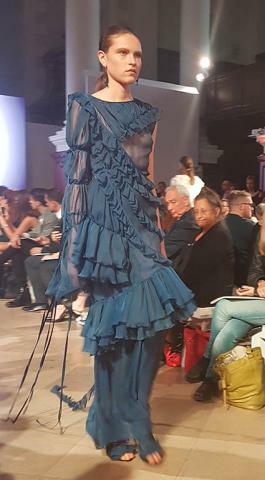 In 2016 Fashion Designer Anna Sui, Dame Zhandra Rhodes, Nicholas Oakwell, Biba founder Barbara Hulaniki, Illustrator David Downton, Harper's Bazaar Editor Justine Picardie and Kate Finnigan of the Daily Telegraph where amongst the line-up of leading industry names for Bath in Fashion centered around the museum. 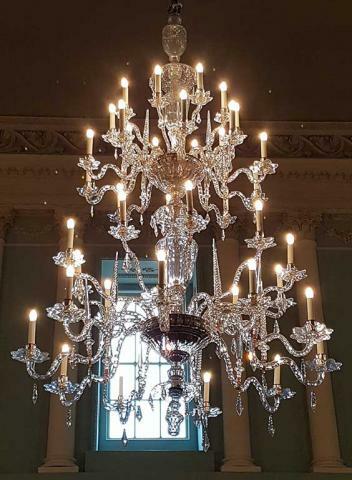 It's location inside the stunning setting of the Assembly Rooms is very apt as it was here over several generations that courtships took place, families met, people gossipped and discussed the latest spa remedies and treatments that could be found in the spa town. 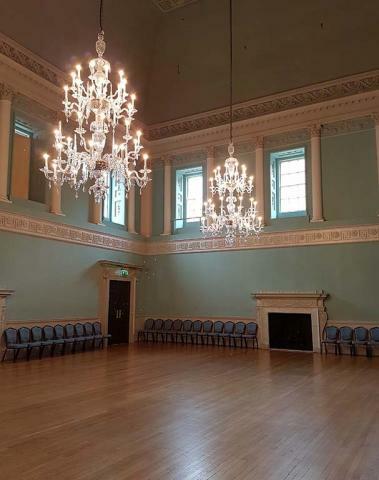 The twin halls of The Assembly Rooms with their central octagonal chamber are grand and ostentatious offering a window into life in the town when families, merchants and travellers came to stay for a season or sometimes many years. 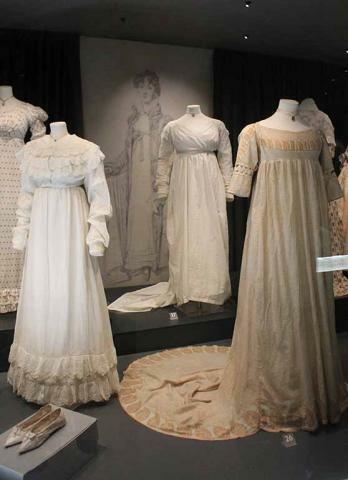 Just like in the novels of Austen and her contemporaries a fascinating social whirl ensured with lots of dancing, some drinking and lots and lots of fantastic fashion. 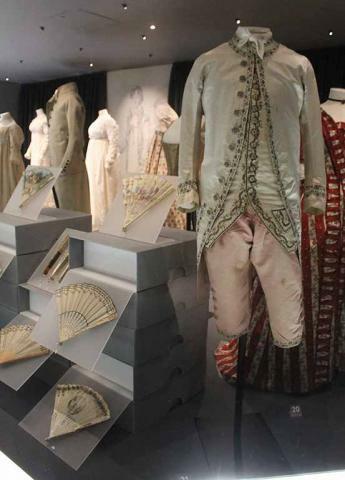 British fashion led the world and also the creation of garments by skilled British hands using fabrics and materials sometimes brought across the world by ships owned by East India traders, many of whom came to Bath to spend, relax and socialise. 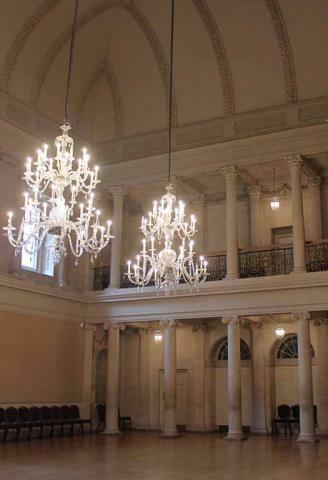 Today the rooms are home to the Bath Fashion catwalk shows and also used for filming for TV and film productions. 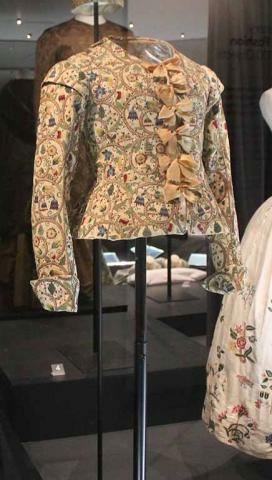 Housed on the lower ground floor of the Assembly Rooms, the Museum has a superb collection of clothes from the Elizabethan era onwards. 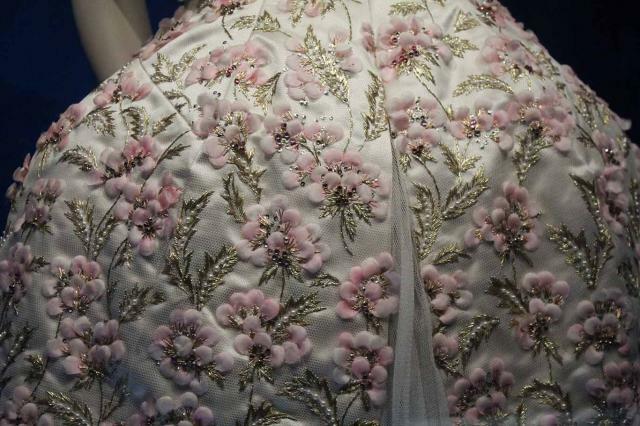 The detail and life in the colours that you can see fantastically preserved is very evident and I immediately tuned in to the craftsmanship and making process as well as what it would be like for the ladies fitted to wear them. Full length dresses, shoes and fans decorated in the most beautiful painted images are easy touch points to find yourself transported to a past time when life was rather different and Bath was bustling with people 'down from London', 'over from Ireland' or 'back from India' for a while. There is a feeling of life that was very much on the move. 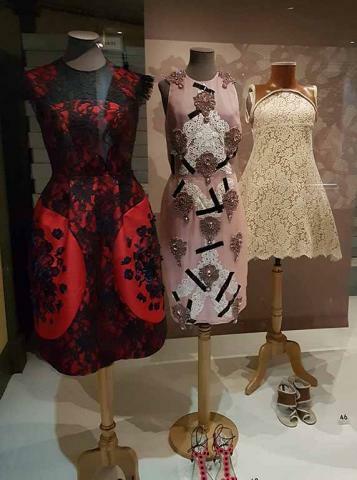 Above are some of the looks from the exhibition celebrating lace that is open until New Years Day 2018. 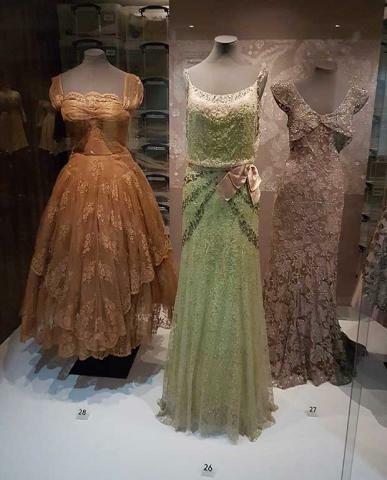 To the left chic evening dresses from the mid 20th century could easily be worn today as vintage and have the touch of timelessness about them. Centre above the dresses from the 1960's and an unusual men's jacket are a playful twist on the style idea. 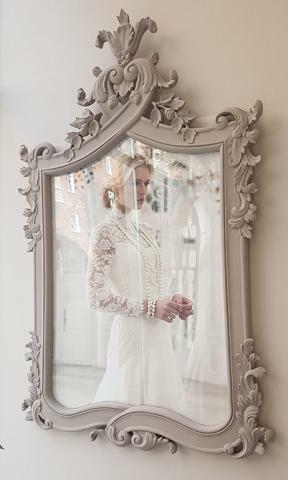 Lace is an ancient traditional skill that owes a lot to it's origins in British centres such as Nottingham before many of their crafts people moved to the famous lace-making towns of northern France. 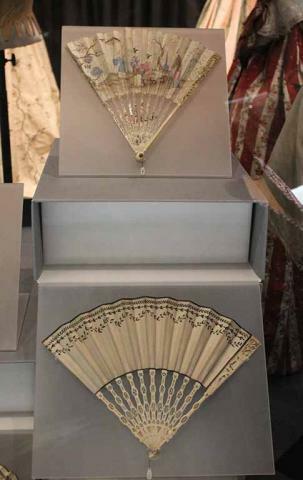 It's one of the fashion skills that you can learn yourself with lace bobbins displayed alongside the Haute Couture and Ready to wear garments. 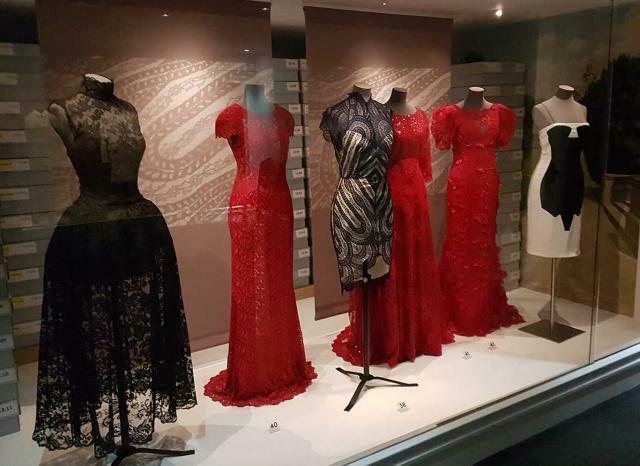 To the right a tour de force of red and black themed lace dresses for black tie and evening events leave you in no doubt, should it ever have occurred to you that lace is old fashion and out of date. It's a very relevant craft and fabric in today's fashion market. It adds a note of elegance that will accentuate looks worn by women across the generations. Colour is a wonderful way to experiment with lace and the pastel tones above to the left show that you can use colour to realise a broad range of looks and styles with lace beyond the well known red, black and white. 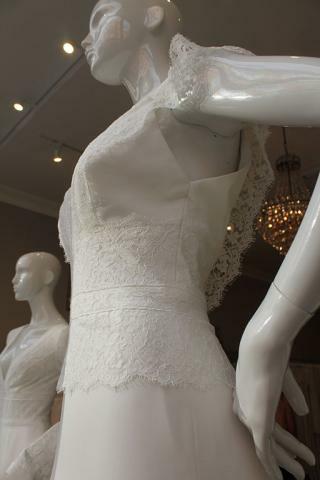 The lace adds another layer of fascination to the garment when in a single colour. There's a timeless beauty and charm at work here. 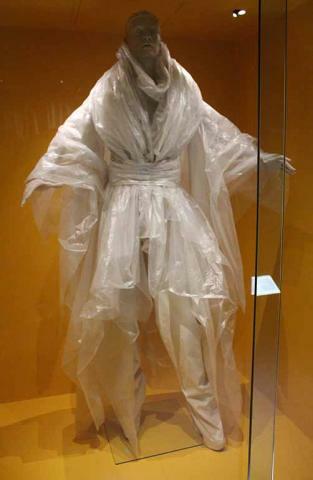 To the right a glass case that details a wedding dress and veil and also some period costumes adorned with lace. 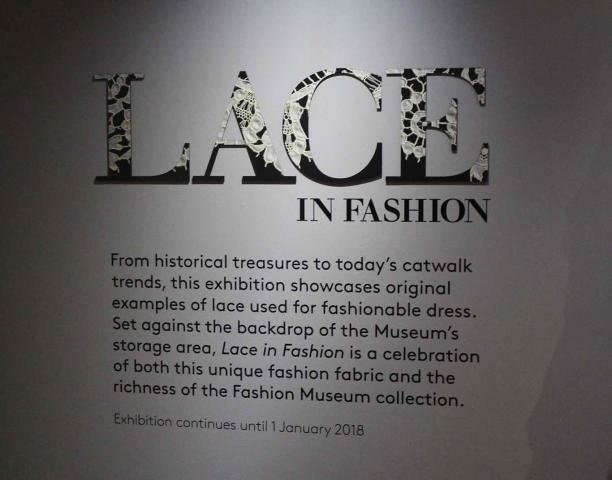 The Museum have thoughtfully produced guides to creating a large number of variations on the lace styles in some of these pieces including the black dress at the back of the cabinet with it's lace apron. 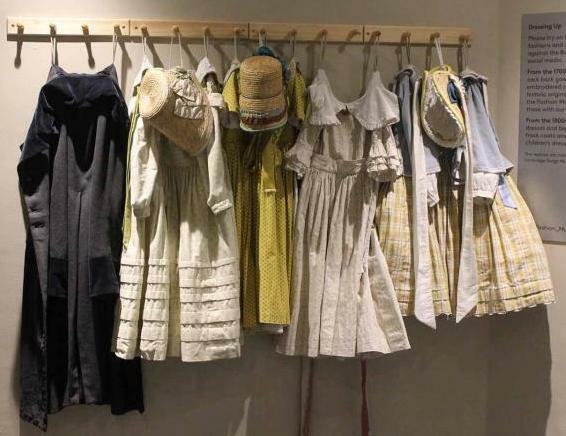 You're also actively encouraged to play dress up at the Museum with a number of looks available to try on to get you into the character of times past. 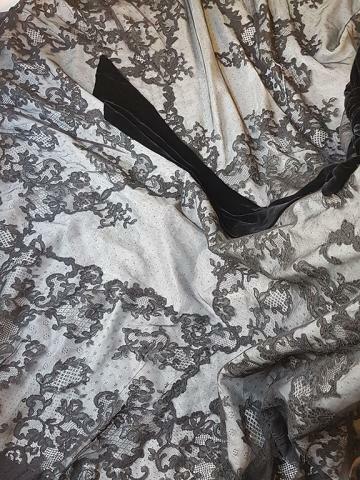 Lace in Fashion is very much focused on showing how the fabric stretches across era's and how how this beauty never loses it's appeal. The detail in the design of these garments won't fail to capture the attention of anyone. 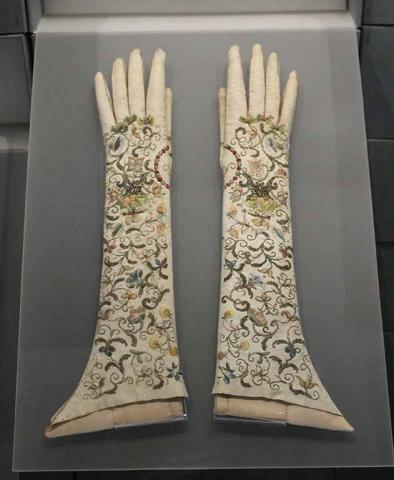 The museum itself is somewhere that anyone with an interest in fashion history must see at some point. I also like that way that Bath Museum placed coordinating shoes with many of the dresses giving a real sense of wardrobe planning and pre-event prep. It's a natural note of composition as we often look at outfits and think about how they will be worn. 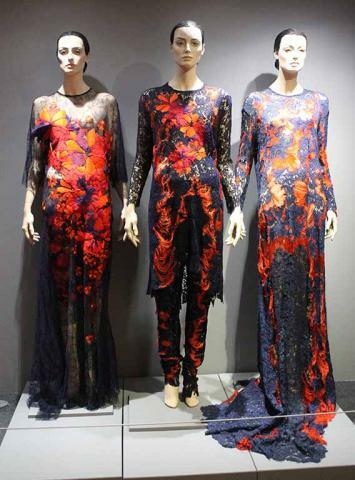 Centre above an impressive trio of evening dresses sit in front of a screen highlighting a lace relief. To the right part of the staircase gallery of portraits descending to the museum from the Assembly Rooms showing models from the 19th century until today. 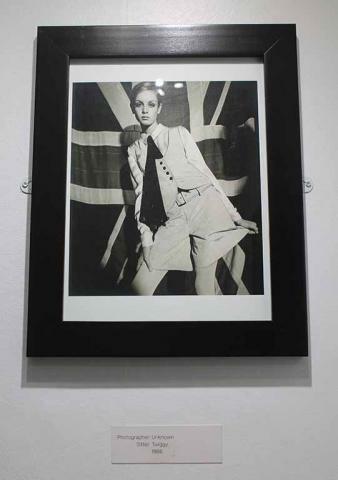 The museum is fantastic but it did make think the addition of a fashion photography collection also would be a perfect compliment. 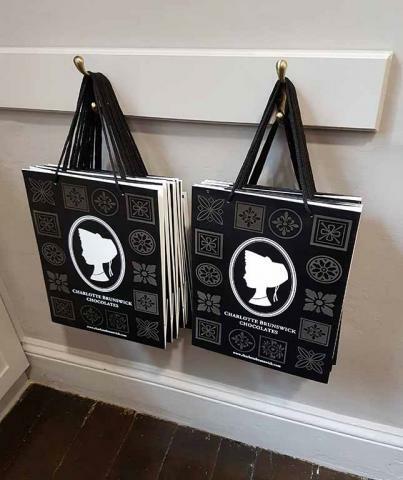 Alongside the strong heritage Bath Fashion Museum is very much tuned in to the international contemporary scene and make one major acquisition each year from a current designers. Above are some of the recent additions to the collection and the Dress of the Year is chosen by a guest editor. 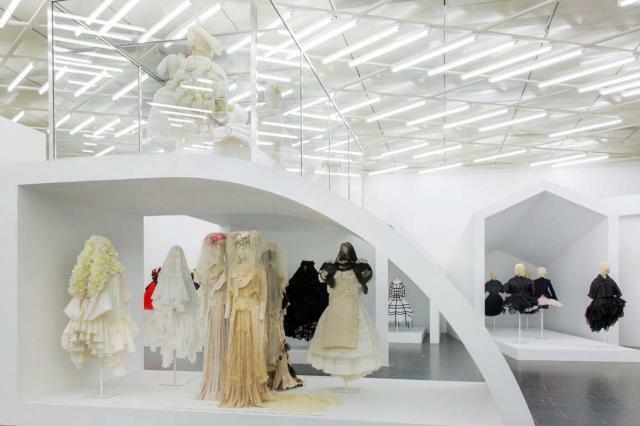 Hamish Bowles of American Vogue chose the House of McQueen dress in 2011 centre above. McQueen dresses many high profile women including Michelle Obama and Catherine Duchess of Cambridge and this look typified the look of a modern consort for Bowles. 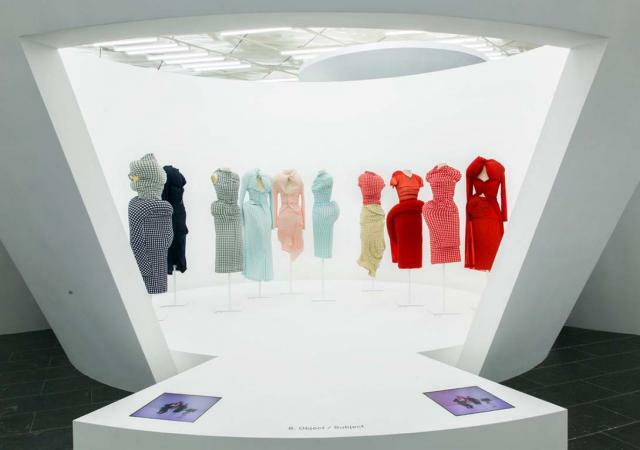 Fashion Editor Vanessa Friedman chose the above Dior look from Raf Simons debut collection for the House in 2012 and the process of making it was also featured in the 2014 documentary 'Dior and I'. Below you can see inset detail of the fabric of the skirt sitting over the classic slim line trousers. To the right the minimalist dress by Gareth Pugh chosen by Editor Katie Grand is the Dress of the year from 2014. 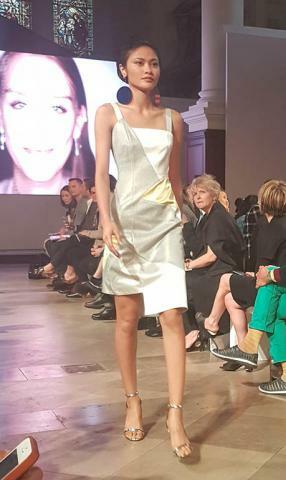 Pugh layered four garments on top of each other to create a look of shiny iridescence saying he wanted to create a look out of nothing that would become something. 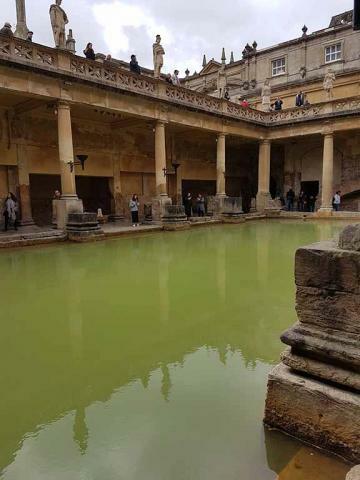 It would hardly be a visit to Bath without seeing the Roman Bath's themselves and for a classical studies graduate like me it was a real treat to see the literal wellspring of a fusion of Roman and British ancient culture. 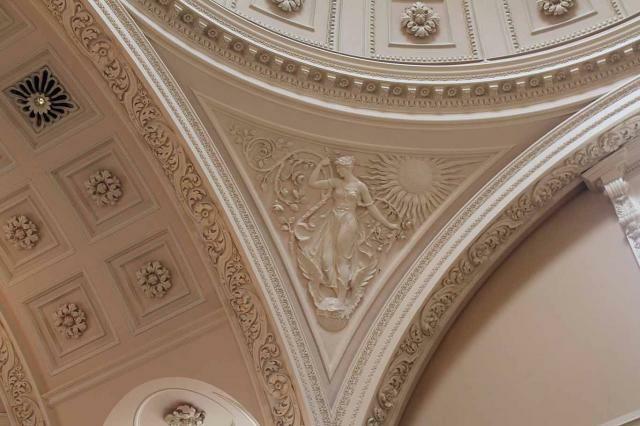 The grand entrance of the Roman Bath's felt like an opulent Opera House and you can spend quite some time here with fine dining and an historic tea room alongsode the museum. 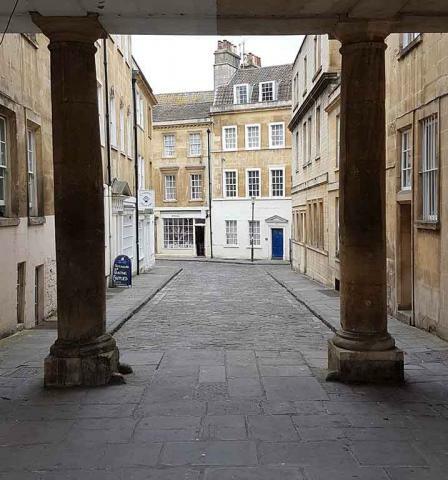 In the 18th and 19th century this was one of the key places to be seen in Bath, re-use of the old Roman Bath's gave a new lease of life to the town and seemed to give a lot of genuine benefit to travellers who used it. On a warm day it was seriously tempting to take a quick dip in the pool and feel for myself the secrets of it's long attraction as a natural hot spring known so well from from ancient British culture that the Roman's made a beeline for it and set about creating a town and civic structure around it. The central pool with it's it's bold permanence of shape flanked by tributaries and adjoining cool and warm rooms give an insight into how this hardy mobile nation had a serious focus on health. Following the Ancient Greek aesthetic of Kalisthenics, cherishing beauty of the body on the outside was a reflection for them of inner health and strength. It's stylish to treat yourself in a spa but the health benefits are reaped within the body for a long time. Beauty and health have been in fashion through every millenia and a durable instinct for preservation of health is matched by the longevity of the site. For Roman's British it was a religious site but the Roman's also saw it practically. 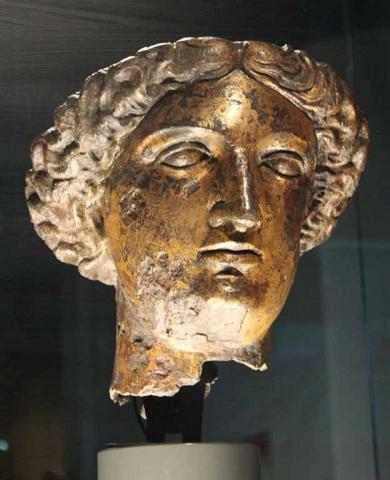 The Romano-British Goddess Sulis Minerva sits amongst the fascinating collection of monuments and stone attesting to life in the Roman era in Bath. It was a cosmopolitan international city that flourished, traded and brought many benefits. Below if the central culvert where the waters of the hot spring come to the surface. You can small the powerful natural minerals in the water and I started to feel quite peckish just from smelling it. Clearly there are strong forces at work here. Trickling forward in managed tributaries to the main pool I felt it was a pity that people can't swim in the pool and get direct benefit from these powerful waters. 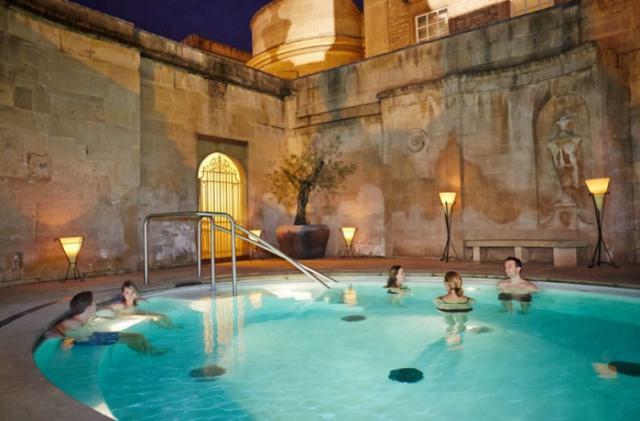 For visitors to Bath today, there is an alternative with the Thermae Spa located on Hot Bath Street open to visitors every day and evening until 9.30pm. It's the only natural thermal Spa in the UK and also offer a wide range of spa treatments in a number of different pools. Relaxing in the roof top pool below looks like a perfect way to to unwind and as you can go in the evening it looks like a fantastic after-work drop in too. 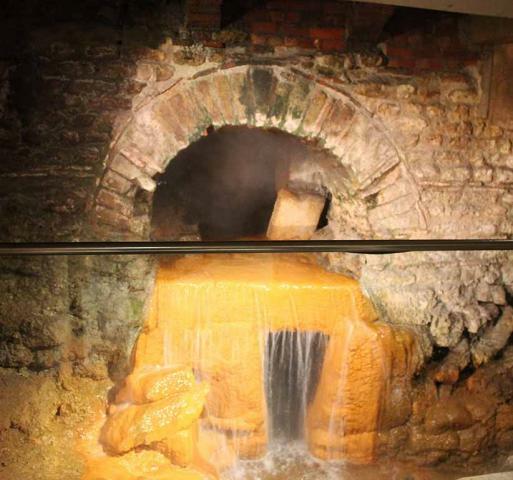 There are actually three hot springs that feed up into the centre of Bath. 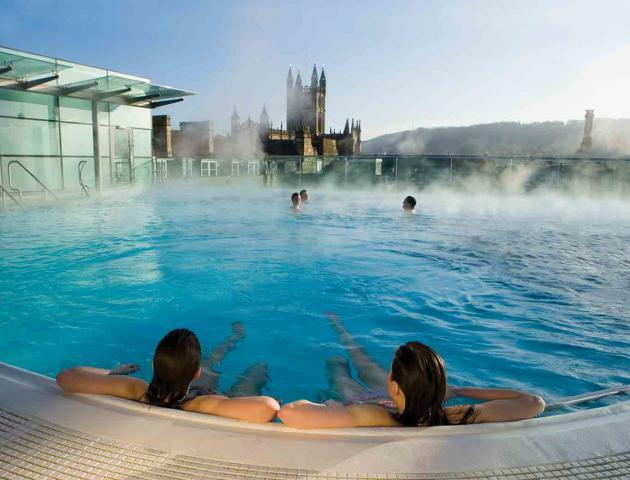 Images of Thermae Spa Bath (C) Dave Saunders. While their geographical exact source isn't known it's claimed that they have been in use for almost 3000 years since tribal Celtic Royal family members discovered their healing properties. The waters themselves come out of the ground containing a combination of 42 different minerals, the most concentrated of these are calcium chlorine and sulphur. I personally think it's the sulphur that's so good for the bones but you don't have to do look at chemically analysing the reasons why when many people today seem to find it effective. 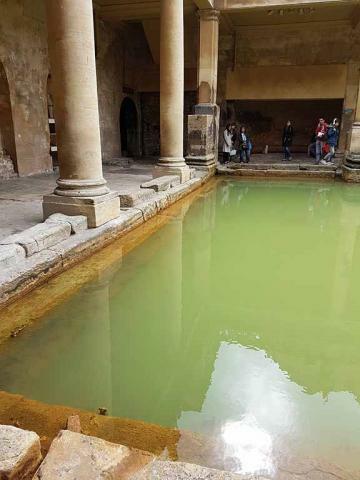 Spa itself relates to the Latin words 'salus par acuam' meaning healing through water that the Roman's saw the value throughout their territory often adopting previously used Celtic sites. 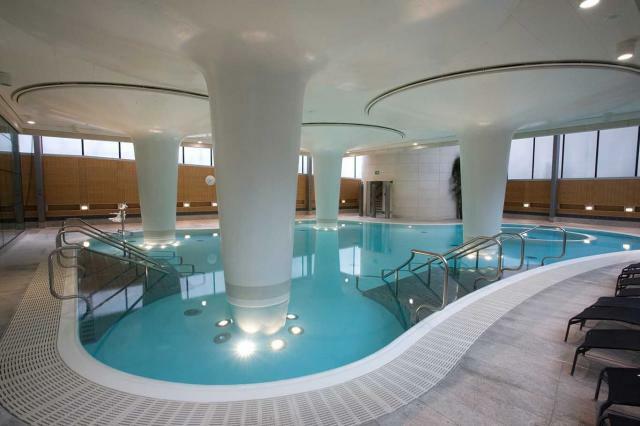 The Thermae Spa receives about a million liters a day of water from the natural springs under the city. 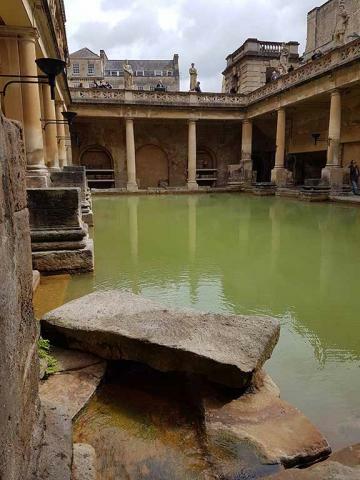 Below to the right, the Cross Bath is actually built on and using the water of the original Celtic Temple to Sul. Now a certified place of worship this bathing pool is on a self-contained site and can be booked for sessions or exclusive use. The Minerva bath to the right offers a cool water experience under cover. 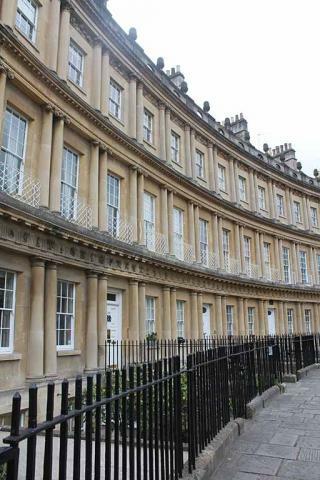 The Royal Crescent in Bath Celebrated 250 years in May 2017 and the townhouse museum at number 1 Royal Crescent offers a view into the lives and frankly some of the scandals that took place in the crescent and Bath during the Georgian and early Victorian era. 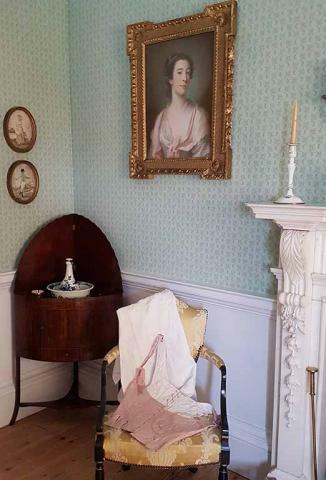 The house is modelled to a time when it was inhabited by a Judge but also has the feel of a family home with careful attention paid to the lifestyle and fashion of both sexes during the era. 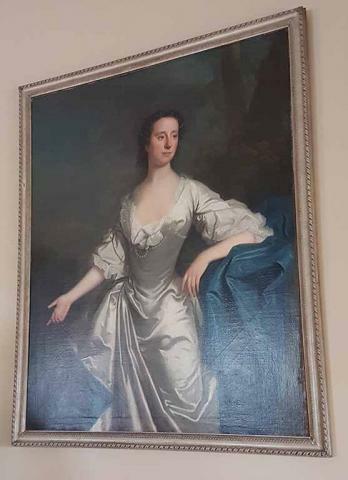 The furnishing is on point as you'd expect with a mixture of historic and reproduction portraits (as the two below of a lady and kindly George III). The rooms are laden with idea for games and entertainment. 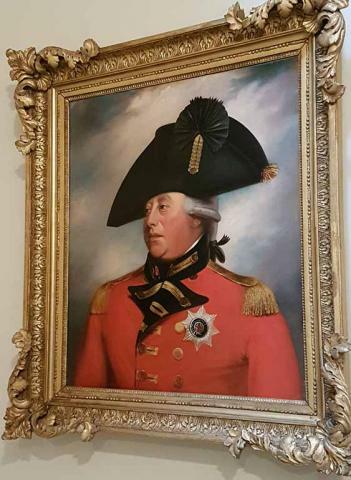 A contemporary reproduction of a well known painting of George III. A contemporary reproduction of a portrait of a lady hung next to one of the young Duke of Gloucester, son of Queen Anne. For me personally it was a reminder that I life for women in this time was too restrictive although there where plenty of hints around to the intellectual interests open to women at this time in the age of enlightenment. It was a time when some liberties for women increased greatly and from the lively stories told of the residents here, rubbing shoulders with cards sharps, engaging in duels as well as a genteel crowd looking for culture and like minded conversation, it seems that life in Bath had a far more racy side to it that is only hinted at in the novels of Austen with the youngest Bennet sister eloping in Pride and Prejudice. 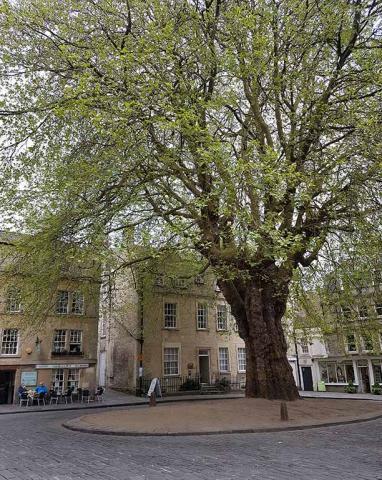 Bath also offered a slightly slower pace of life than London' society and it was also a cleaner town as well which was another benefit in the hot summer months. 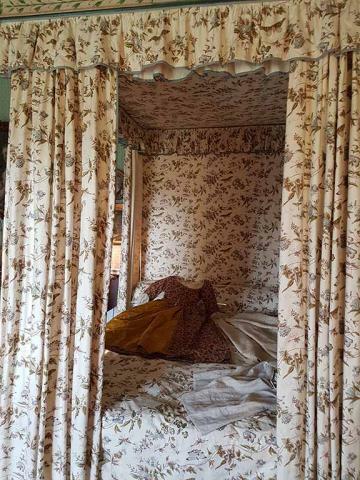 Scenes from the ladies bedroom. 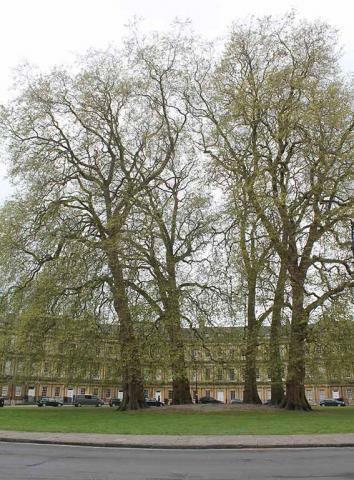 So what did Jane Austen make of her fellow inhabitants of Bath during her time living there. It may surprise some but actually she rather looked sideways at them. While it proved a great source of news and ideas for her novels Jane, the Parsons daughter from a quiet country Hamlet of Steventon and known to minor gentry and villagers alike was rather taken aback by the hedonism seen amongst some of the inhabitants. 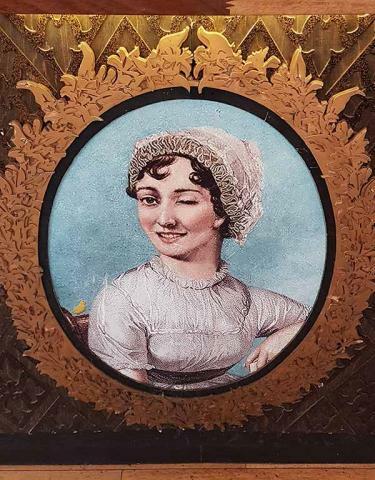 Not withstanding her possible views on the town's inhabitants and their louche behaviour Bath Gin have made Jane their cover girl adapting the portrait most commonly attributed to her as their badge. 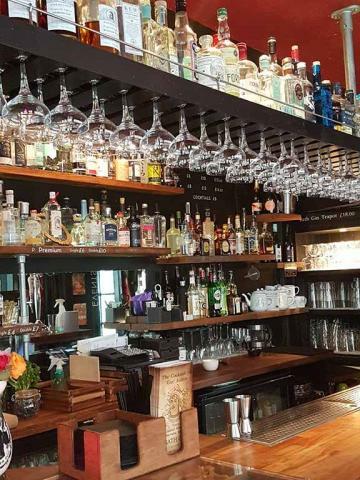 For anyone with the slightest interest in gin this business established in the last 5 years is a definite place to mark on the map. 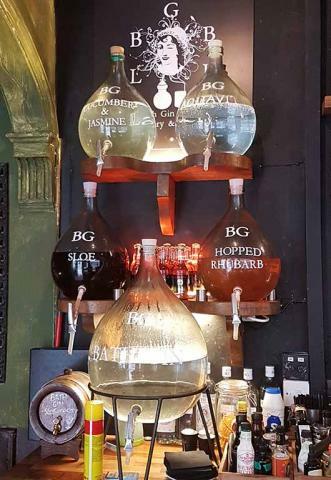 Walking in to the light fresh smell of hops, junipers and light citrus hints it's clear that beyond the marketing their is a very serious effort underway to produce connoisseur gins that will hit the spot, even with people who don't think themselves gin drinker. In it's beautiful Georgian townhouse setting it has the feel of Jane's era but it feels very shopper friendly and it's happy, bright team are warmly welcoming. Another place to walk into that feels like a step back in time is Rossiter's of Bath. Walking in to the ground floor with heaps of beautiful china and linens to explore is an easy way to pass the time and also a hot spot for finding some very good quality gifts for friends and family (or even yourself) that arn't as expensive as you would see in the capital. On ascending to the first floor you enter, what could easily be described as Jane Austen's haberdashery. I was amazed to see the antique panelling and window seats and the photographer inside me was visualising all kinds of cinematic sets and scenes. Here a very wide variety of fabrics is on offer including those from the nearby Mulberry mill in Somerset that is much less well known that it's retail fashion counterparts but still just as high quality. It's an interior design dream and also in further galleries of this huge store there is large collection of contemporary design furniature that's stylish and charming. 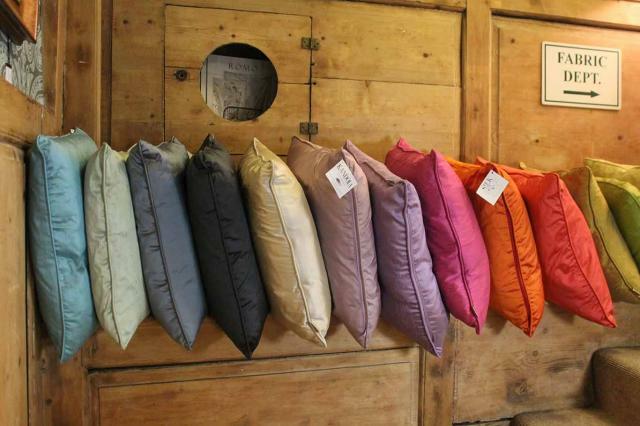 I don't think there can be many happier sights on a landing than seeing a rainbow wave of scatter cushions before your eyes. 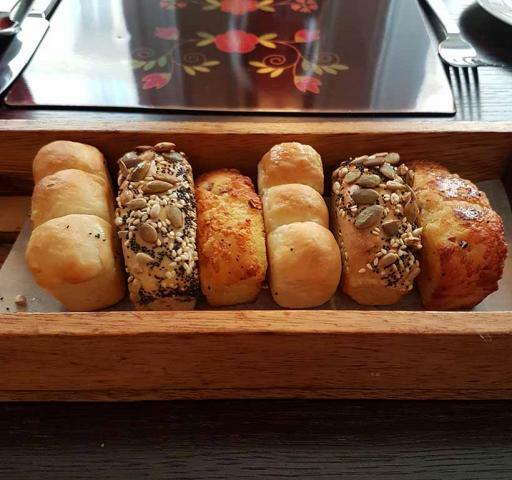 Stopping for a light lunch at the Gainsborough Bath Spa Hotel restaurant I was conquered by the delicious freshly baked artisan bread and cream cheese butter even before the three courses began. They offer a delicious contemporary menu and the Hotel's Spa and rooms are an absolute delight. 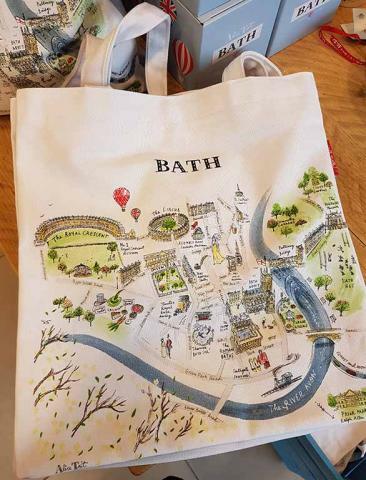 With a closet full of tote bags I could easily make home for this one below, thoughtfully illustrating various fun places to see and discover in Bath. The town is filled with beautiful old buildings that capture the light of the stone in the most wonderful way particularly in bright sunlight and early morning and sunset. 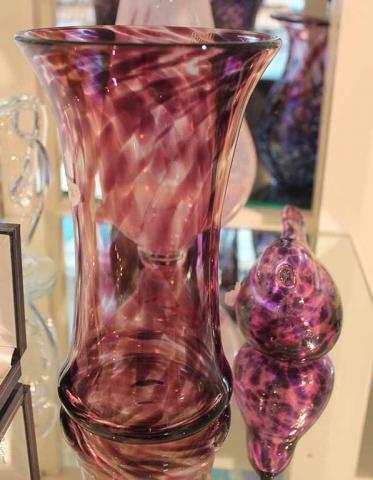 One of my favourite types of art to admire that makes a great collectible or gift is glass. 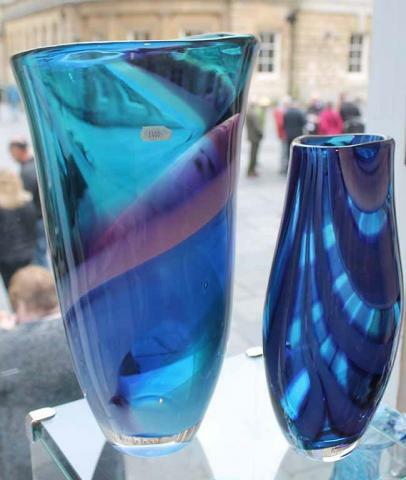 Bath Aqua Glass sitting next to the Cathedral and channelling both roman and medieval ecclesiastical glass blowing heritage has a large offering of pieces that capture the light in a beautiful way. From vases and pitchers to hanging stained glass plates and pendants it's quite a unique store that feels like it's filled with light. 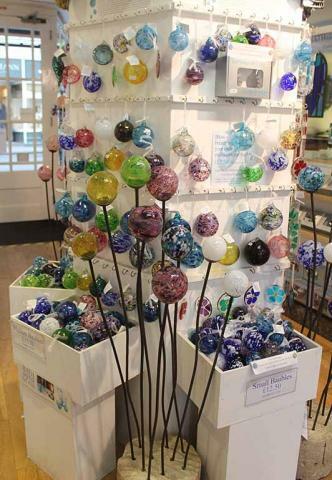 The team also make glass baubles that can be used as gifts or ornaments and also make a fun Christmas gift. There's also something cooling about glass on a warm day whether filled with water or not and the gentle reflections of light and that it creates dance before the eyes in a beautiful way. I could do serious shopping in here. 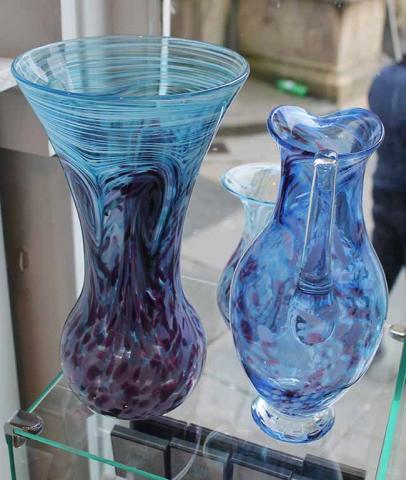 The team demonstrate some of the glass making on-site giving an insight into the techniques and process used to make them. 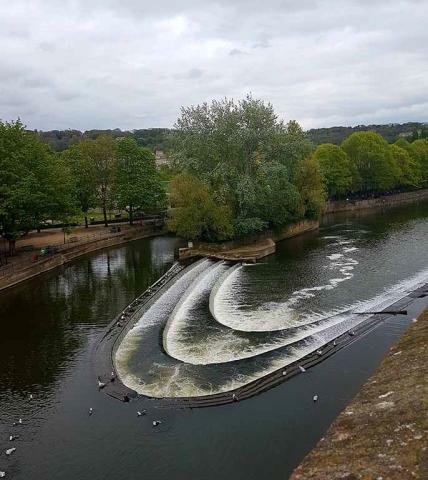 Taking in the sights of the town as you walk; one essential place to see is the famous weir offering perfect angles for some classic shots from Bath. With the city centre on one side and lush green parkland on the other it shows how the cityscape appears to naturally blend into the countryside in this Market town. 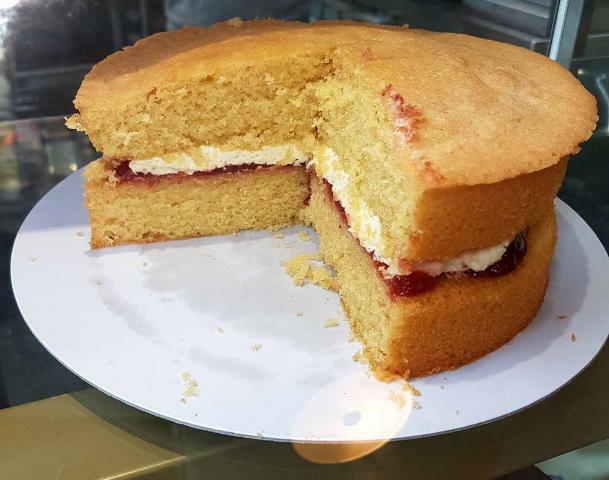 Walking across Pulteney Bridge, spanning the River Avon, towards Laura Place takes you past some tiny cafe's with amazing views and lots of fresh home made food including delicious cakes. 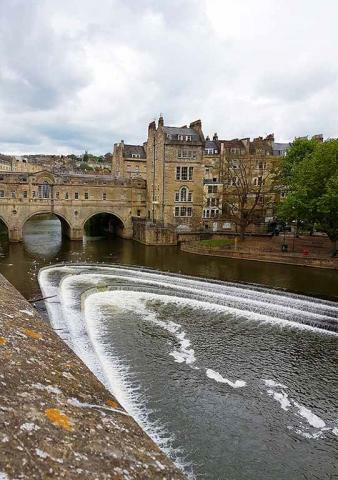 Bath is a little town but you'd be pushed to see all of the highlights in one weekend. My whirlwind dawn to dusk visit covered far more than I can show here and proved what a fountain of happy discoveries are to be found. On the subject of food, with the help of the Foodie Bugle team Bath is channelling it's market town routes and helping to launch the Great Bath Feast Food Fairs taking place in October and November. 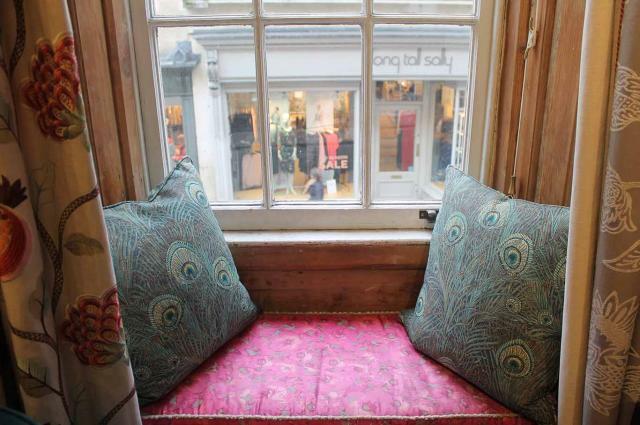 One particular gem of shop in Bath that serves the Vintage and Bohemian themes that seem to be popular well is Instant Vintage. 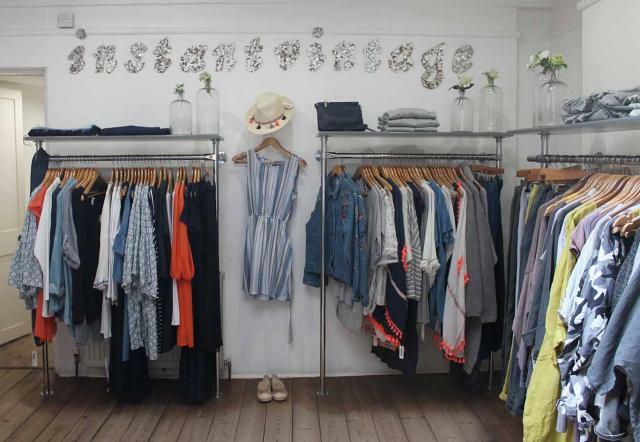 The store specialises in selling new pieces that have the look, feel and quality that you find in vintage stores when you have that lucky moment but are new. 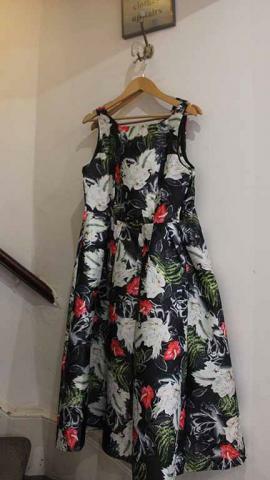 Selling everything from Tea dresses and pieces that you could go to the races in to beach friendly and country casual clothes. 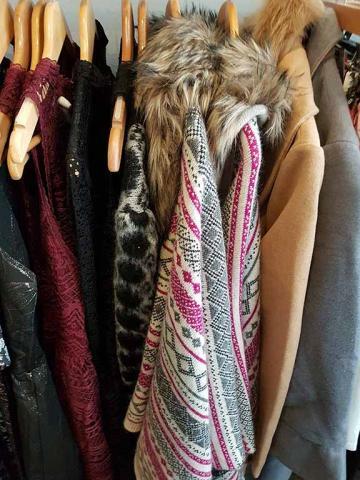 Broadly speaking you can find extra pieces to fit into the wardrobe to wear across all seasons and at a sensible price point it's open to all. Bath is definitely a shoppers paradise for mid priced retail fashion. Milsome place in the heart of town has staples such as Hobbs and LK Bennet while dotted around the gentle warm coloured winding roads are a series of high street names. 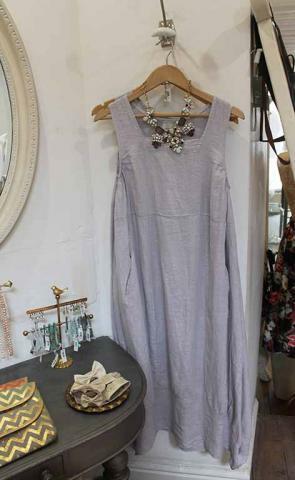 As a rule the one-off boutiques like Instant Vintage tend to found further from the town centre nestled amongst antique shops and cafes in slightly quieter spots that have a stronger feel of the towns history. It all the more fun to discover them. 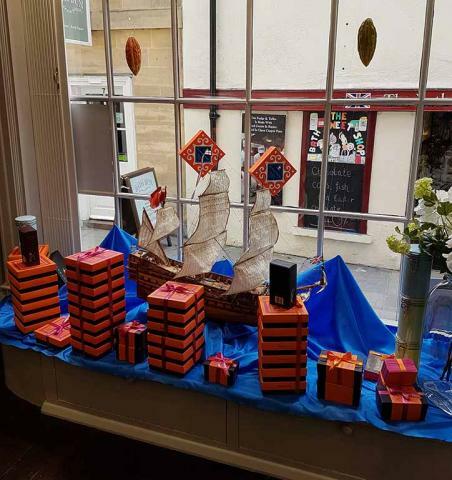 Also up in the arty areas of Bath on Bartlett Street the artisan boutique Artcle sells a wide variety of home crafts and seasonally scented products. 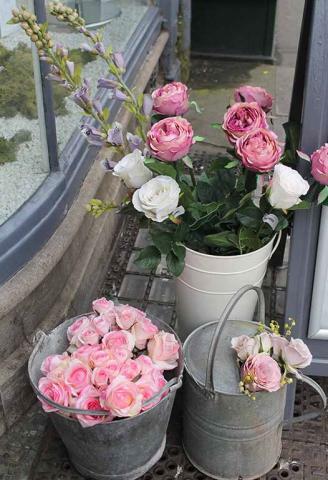 Founded by Lucy Simon in 2013, Lucy also teaches floristry while also selling local rarer flowers that are found in the West Country and also being an official supplier of David Austin Roses. at the store that connects through to the contemporary art gallery of David Simon. Lucy uses colour as her basis for organising how and what she sells and colour is key to how she designs collections of objects. 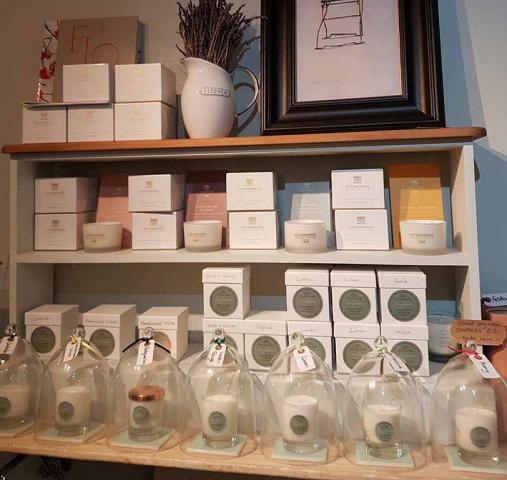 The making process is important to her and her candles are made on-site using soy wax and natural oils. 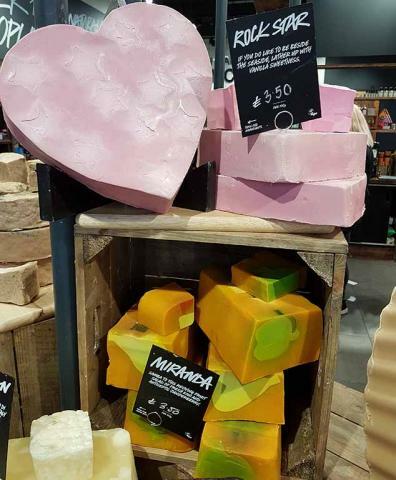 A very broad smile played on my lips when I saw the local branch of lush. 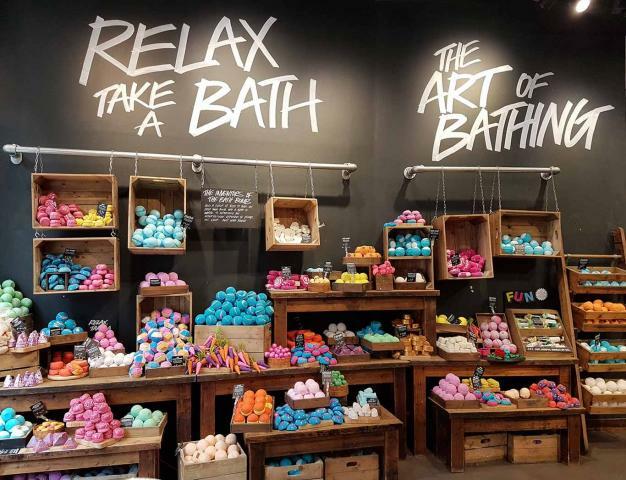 As you would expect in the City of Bath they have one of the largest displays of bath bombs and delicious soaps that you will find in any store and upstairs there is a very funky Spa. As clients where there during my visit I couldn't photograph but is you're passing and looking for a more funky and highly colourful spa experience I would definitely recommend it. 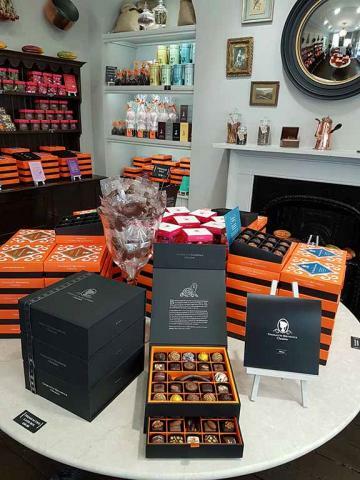 My final discovery to share was the fascinating chocolate shop of Charlotte Brunswick. 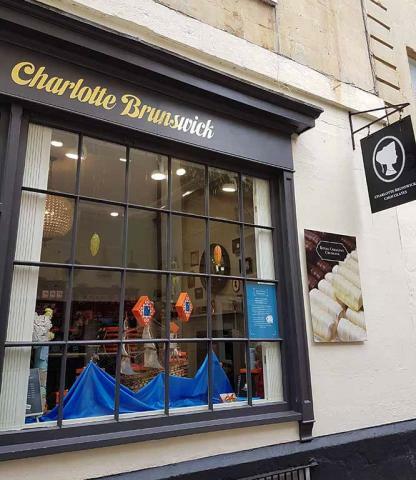 Charlotte was a very special women, she was the first chocolatier to come to Bath in the 18th century and imported the finest coca expertly blending it with herbs and spices in a way that many chocolatiers didn't do for a long time. 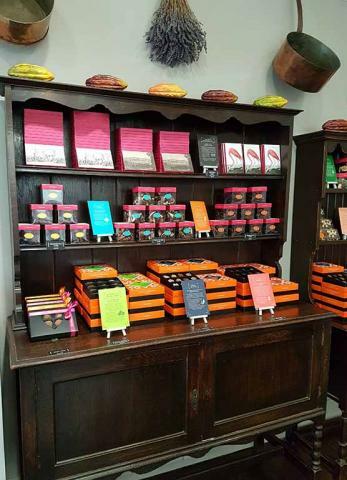 The business today is located in the quiet old town on church street and the chocolates created by the Master chocolatier are still faithful to Charlotte's original recipes. and the Summer exhibition: Rei Kawakuba/Commes des Garcons - The Art of the In-between. 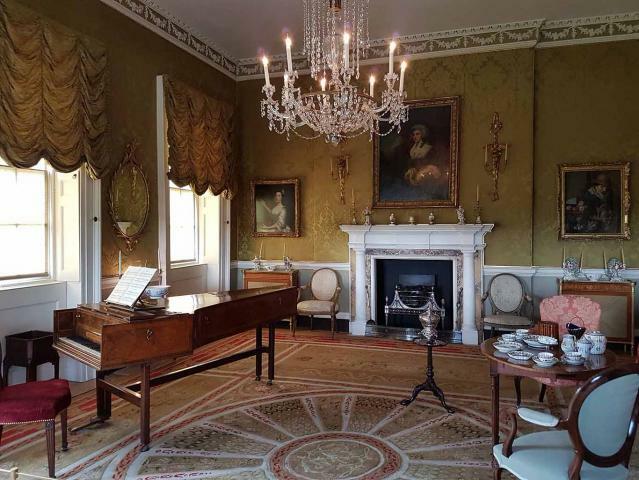 The Music Room and Ladies drawing room. 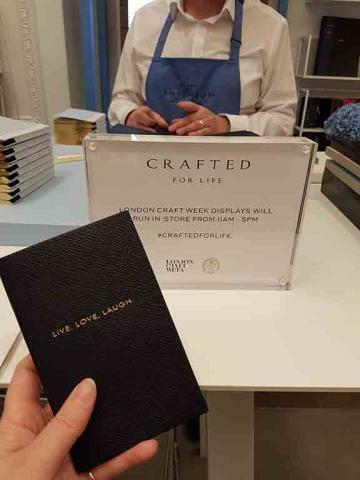 London Craft Week with Mulberry, Smythson and Bamford - a feast of fashion delight. 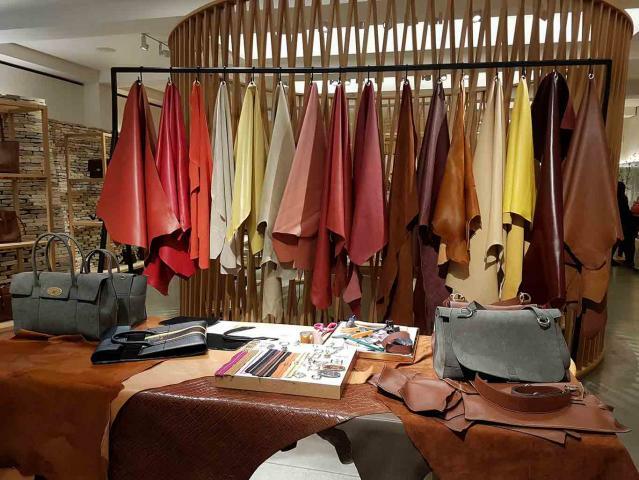 Now firmly established on the fashion calendar and usually held in early May, London Craft Week is a really important moment when London celebrates the artisanal craft behind it's luxury goods industry. 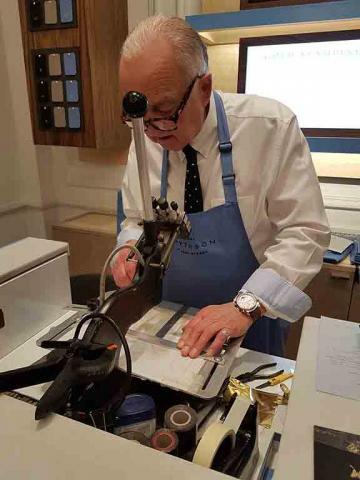 It's hardly a surprise then that Mayfair and St James are centres for a multitude of open-house demonstrations and parties that shine a spot light on the work and effort that goes into creating so many special items that we treasure and give as gifts. Anna Wintour in Chanel. Getty. Naomi Campbell wearing Azzedine Alaia with her friend Edward Enniful. Getty. Lily-Rose Depp in Chanel Haute Couture. Getty. Cara Delevigne in Chanel Haute Couture. Rex. Bella Hadid in lattice catsuit by Alexander Wang. EPA. Natasha Poli wearing Michael Kors. Getty. Giselle shimmering in Stella McCartney. Rex. Adriana Lima in Ferreti dress and chopard jewels. Wireimage. Hayley Baldwin in Carolina Hererra. Rex. Miranda Kerr in Osca de la Renta. Invision. Daisy Ridley wears Osca de la Renta. Film Magic. Dakota Johnson in Gucci. Getty. Doutzen Kroes. Brock Collection. Getty. Katie Holmes wearing Zac Posen. Kate Bosworth wear Tory Burch. Rex. Elle Fanning in Miu Miu. Rex. Jessica Chastain in Prada. Getty. Rhianna in Commes des Garcons wearing DSquared2 sandals. Karen Elson in Lanvin. Getty. Candice Swanpeol wearing bespoke Topshop. Rex. Felicity Jones in Erdem. Getty. Lupita Nyong'o in Prada and Tiffany & Co jewellery. Getty. Janelle Monae in Ralph & Russo. Getty. 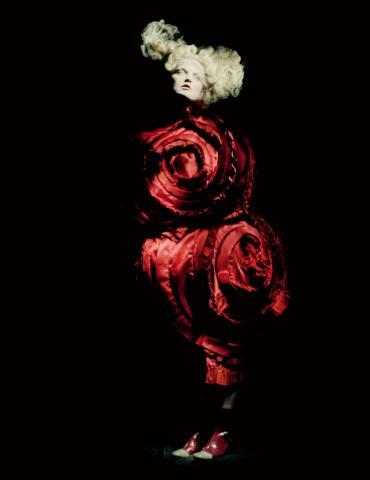 Rei Kawakubo for Commes des Garconnes. 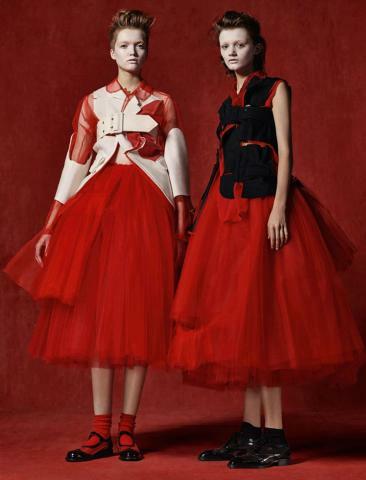 Blood and Roses from the Spring - Summer 2015 collection photograph by Paolo Roversi. Rei Kawakubo for Commes des Garconnes. Body meets dress meets body Spring - Summer 1997. Photograph by Paolo Roversi. Rei Kawakubo for Commes des Garconnes. Photograph by Paolo Roversi. from Autumn - Winter 2010-11. Photograph by Craig Dean. from Spring - Summer 2016. Photograph by Paolo Roversi. Spring - Summer 2007. Photograph by Craig Dean. Autumn - Winter 2016-17. Photograph by Paolo Roversi. Rei Kawakubo for Commes des Garconnes. Gallery views (C) The Met Museum. Bella Hadid smiled coyly in an Alexander Wang lattice catsuit showing her outfit to the cameras and international audience but not afraid to show how much she enjoyed the event. With it's sheer effect under the outfit gave the impression of giving more away than it did. For those who are little less bold or in a cooler climate the look could be complemented with a long length cape or gown-coat. 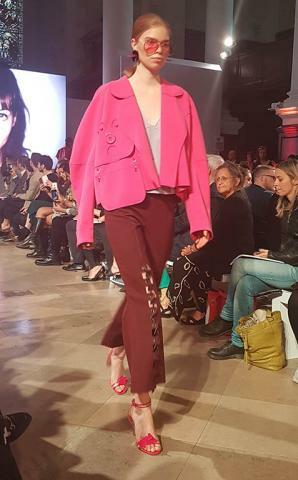 I noticed in this look as with several this season there seemed to be trend more towards emphasising the curves of hips and the more womanly shape. 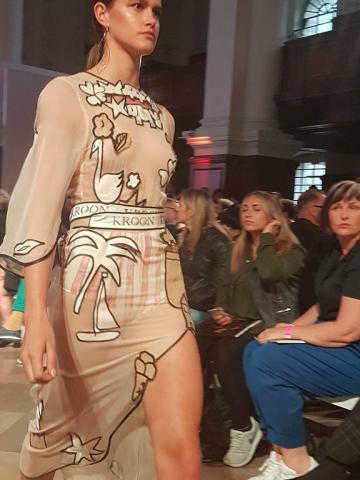 Natasha Poly to the right wearing Michael Kors was also hinting in this direction with cut away detail at the waist and chest echoing the figures natural symmetry. 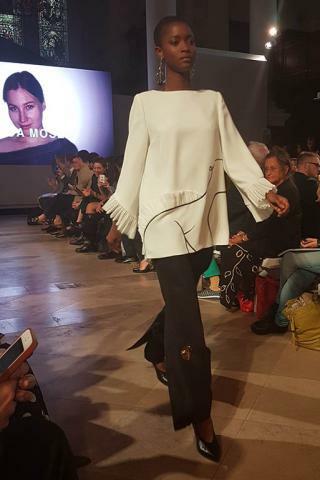 A thigh split added a note of contrast elongating the silhouette and the asymmetry of the sleeves was diluted within the composition. Giselle gave her own masterclass of demure red carpet style that may like many of the looks worn, been a more conservative interpretation of the Comme des Garcons dress code but proved a red carpet hit that will stand the test of time. Her fellow Victoria Secret Angel Adrianna Lima wore Ferreti in a chic display of well the simplified lines of a floor length gown can work. In simple black with Chopard Jewels, it's a look easily adaptable for clients of Ferreti worldwide. 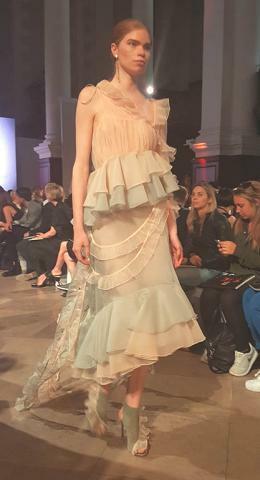 Pettycoats transformed into full skirts in contrasting sugar pink and white and a figure hugging bandeau top add a texture contrast to the skirts in a look resembling either sports wear or the boudoir chic of 1950s formal wear depending on your perspective; it's couture ballerina impression accessorised with a choker and netted veil giving a 1950's evening-wear feel to a look primed for the camera and a modern fairytale in New York. The long lengths of the skirt form a soft train behind the wearer matching the 'white tie' feel. Miranda Kerr wore an above ankle Osca de la Renta look employing the lines of classic mid twentieth century glamour that the House is so well known for. Nipped in at the waist it's subtle seduction lies in the classic fit and flare style. The impression of acres of fabric dotted with beautifully embroidered flowers typifies almost fantasy notes of elegance that we expect to see on this 'red' carpet. Daisy Ridley in monochrome Osca de la Renta showed floral patterns echoing the nearby surroundings of Central Park. A scooped neckline reminiscent of vintage 18th and 19th century dress forms gives form and structure descending into a skirt with train capturing the full romantic appeal of haute couture. Dakota Johnson looked beautiful in a black gown by the House that she is currently the representing face of. The floor length dress by Gucci in black captured romance with ruffles and waves falling across the shoulders and bodice and down the lengths of the skirt. Taking a leaf out of pared down a slightly more experimental Doutzen Kroes wore a Brock Collection dress that seemed to channel traditional country dress of Europe, particularly France in bygone centuries. This gentle off the shoulder style captures a look of innocence and carefree beauty while still completely appropriate for a formal event. To compliment the look Doutzen also wore her hair lose in a pared down style. Katie Holmes played it safe with a modern classic, the fish tail gown. Elegantly re-mastered by Zac Posen in teal with off the shoulder cut the ruffles at the upper and lower areas framed Katie's female curves. Kate Bosworth also chose a look that had hints of the circular themes so often seen in Commes de Garcons pieces. Looking also faintly Elizabethan around the neckline this demure look would suit a wide variety of occasions. Elle Fanning's beautiful Miu Miu dress raised eye brows for it's romantic interpretation of the dress code but this sugar sweet baby blue number won plenty of admirers and also met with the other quiet raison d'etre of the evening; namely showing the high fashion buying audience the world over what they can look to buy from Miu Miu for their wardrobes in the coming months. It may be A list stars that you see in front of the cameras but this event is also a shopping guide for perhaps tens of thousands of wealthy women around the world. Jessica Chastain looked coolly serene in a lemon yellow dress by Prada triggered the thought that we should see Lemon more often. It's delicate and romantic and like Elle Fanning's look worked the soft romantic vibe. Rhianna is a woman who likes to make a red carpet statement and didn't flinch from meeting the dress code head-on. She wore the designer exhibition subject Commes des Garcons with floral fabric overlaid with floral circles broadly echoing an undercurrent of circular shaped style on the red carpet. The sandals of DSquared2 laced up the leg gladdiatorix style show willingness to do battle and make that striking impact in front of the camera. Gigi Hadid wore Tommy Hilfiger in a light caramel shade working the two opposing styles of tailored suit and flowing dress in one garment. Carrying gender neutral vibes forward in the fullest sense. Her sleek natural brunette locks blended perfectly with the tonal contrasts of the complete look. 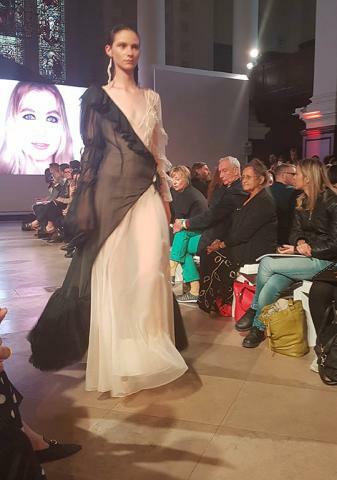 British supermodel and musician Karen Elson also opted for the romantic look with a long flowing skirt descending from a figure hugging upper garment. A perfect piece for a Summer evening exploring another delicate colour composition in peach; the mother of two showed why she's a leading light in fashion and music. Showing that Red Carpet glamour can be found at the High Street, well very nearly, Candice Swanpoel another of the VS Angels wore a bespoke Topshop gown. 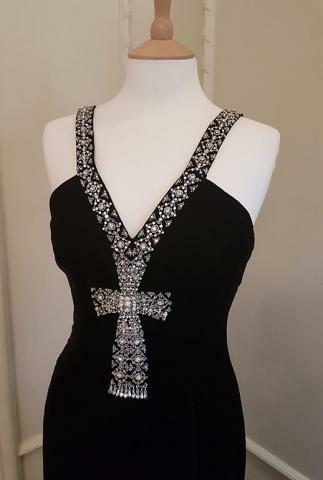 This classic look in black showed that you don't necessarily have to spend a fortune to buy, commission or even (whisper it) create a Haute Couture piece that is red carpet ready. Felicity Jones wore a gown by Erdem in delicate light blue that seemed to Chanel an Edwardian silhouette with it's dipped asymmetric ruffles making a new play on the bustle and a layered fishtail trailing behind. Lupita Nyong'o carried off her Prada gown with her characteristic warm charm and look relaxed and at ease in front of the cameras as always. Her gown was in one of the surprise favourite colours of the early summer season and orange with feathers around the bodice and on the train. It's always lovely to see designers accompanying their clients on the red carpet allowing them to receive acknowledgement for all the hard work that they and their team put in to create gowns that support their clients and help them look their best. 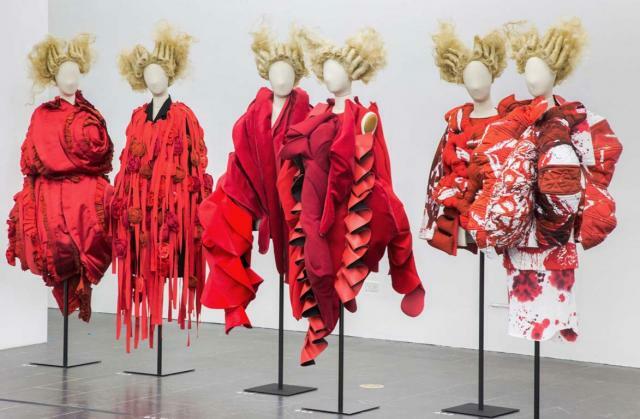 The Met's Summer exhibition exploring the work of Rai Kawakubo for Commes des Garconnes moves between surrealism and gentle re-interpretations of established style. 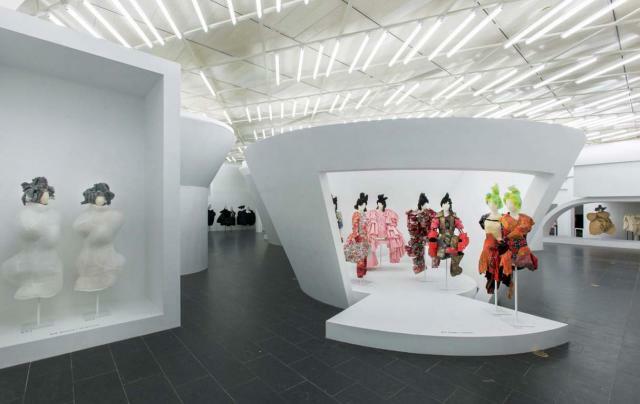 It's the second year running that the Museum has looked to Asia for it's Costume Institute theme and Andrew Bolton the British head of the New York museum clearly sees plenty in the east to explore. It's also a silent nod to the strength of Asia as a creative hub and a fashion market in the truly global fashion world. The still images of pieces from the exhibition shot by Roversi and Dean capture some of Kawakubo's desire to present something very different than what we perceive as 'normal'. This is art meets fashion and the exploration of ideas of the mind on the figure. The above dress known as 'Blood and Roses' from SS 2015 takes the theme of love and the delicate folds of the rose petals, of ancient fascination, and schemes an outfit around it. The model looks heavenward imitating the raptured gaze shown in western christian iconography but this is a humanist love and a humanist statement of live, blood and beauty. 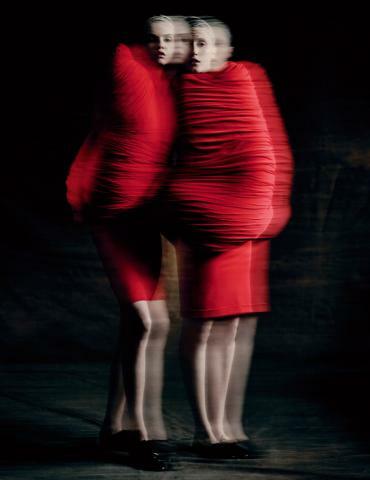 Centre 'body meets dress' plays with the notion of form and structure. 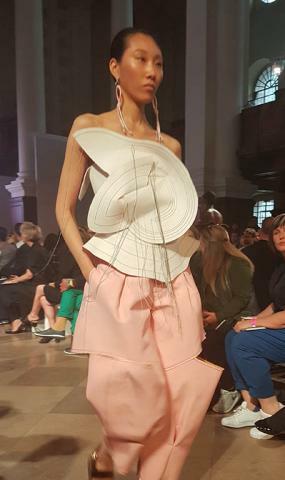 The ballooned shapes around the figure posing a question that someone with a challenging eye may have after seeing many women dressed in conventional fashion pieces. The upper area of the dress appears like a miss-shaped silk cocoon bound tightly on the figure and with arms hidden beneath the silhouette. This may be rather too challenging for everyday wear but Kawakubo is more keen to express ideas and than practicality in some of his pieces. To the right three outfits explore new interpretations of coats and coat dresses. 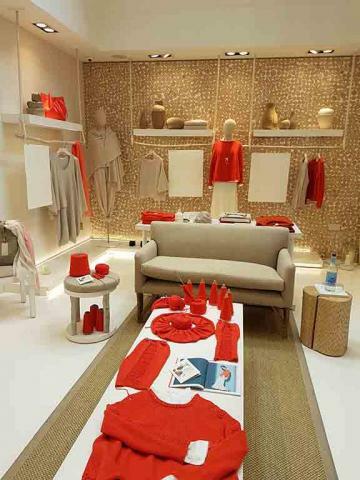 Again red is the dominant colour theme of communication with pom poms adding a note of prettiness to one look while others keep closer to a tone of minimal line. Inside Decoration takes the theme of tartans anciently found in the upper northern counties of today's England and the lands that became Scotland where it's most widely associated. Tartan weave also has routes across Asia as an ancient fabric worn to show tribal affiliation. 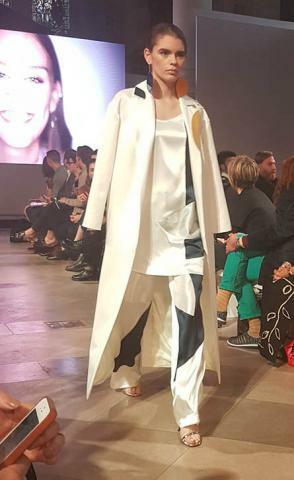 Here these multi-layered pieces envelop the figure in soft rounded cushion-like shapes that seem comforting in contrast to the bold sharpness of the characters portrayal with their slicked back hair and large black combat boots. Standing shoulder to shoulder they give a sense of solidarity meeting you with their gaze and appearing to stride forward to the viewer in a direct encounter. The Blue Witch piece with it's red wig and ash-midnight blue tones melds feathers and pleated fabrics to form a look encasing the figure, something Kawabuko seems to like, leaving a woman not free to use her hands and arms but streamlined into an artistic form. 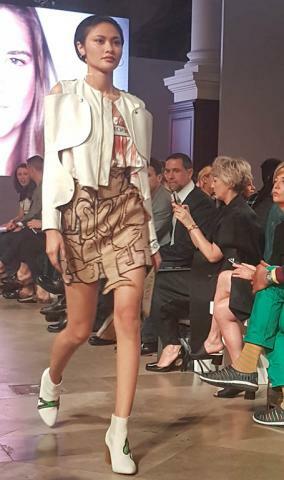 To the right petticoats become elongated to mid-calf length to form the skirt with out-sized buckle detail of the jacket creating a contrast between masculine and feminine forms, the soft and the edgy and urban. Colours are distilled into red, black and white and reducing the need for the eye to wander away from the detail of the outfits. The models gaze squarely out of the image at you showing their bold approach to taking on life. While not emulating cubism in the classic form that we would understand this is perhaps a statement of strength using the reference to cubist art as a pin point. To the right Eighteenth Century Punk shows a side angle view of a re-imagined European eighteenth century dress painted in vibrant pink and green. The seamed layers of the dress give a delicate feminine identity to the garment but the wearer is confined in a corseted frame not too dissimilar to the way in which many of Kawakubo's women are confined. The exhibition is shown in bright clear open galleries as you would possibly expect for a set showing contemporary design. Space is used creatively to show the clothes at their most visually striking. 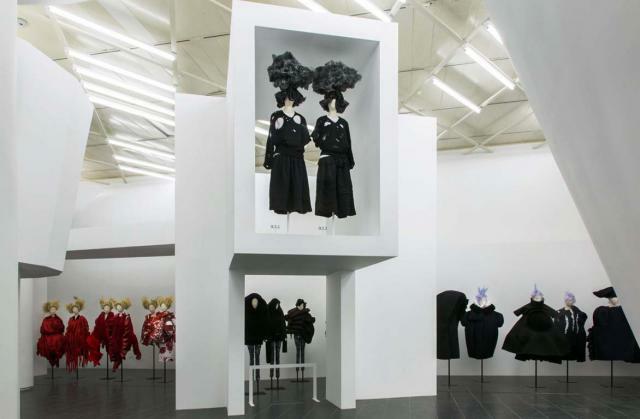 Placing the garments against a white background emulating the white gloves and coats of curators gives the sense of clinical preservation alongside neo space-age art deco adding to the 'other wordly' sense that you feel Kawakubo is aiming for sometimes. 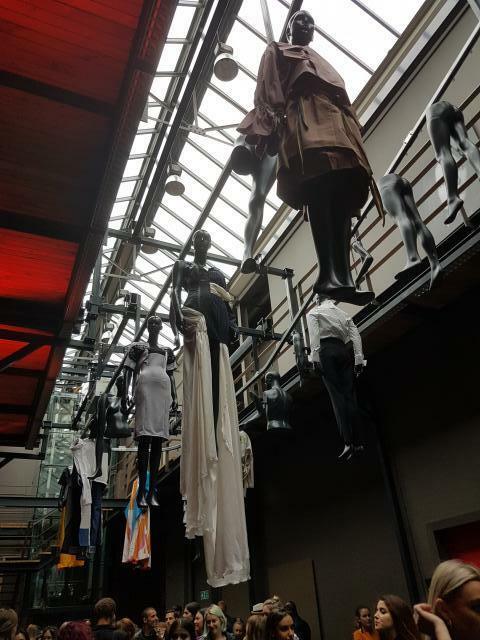 Dresses that have many layered skirts and more 'ball gown' in style are placed higher on walkways suspended above the main exhibition area allowing visitors to view the garments from below by looking up to see the construction as well as standing side to side with. 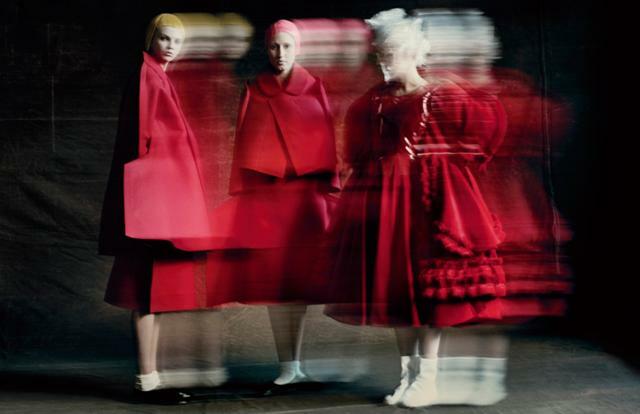 The semi-circle of dresses with their prominent bustles highlight Kawakubo's exploration of the historical and modern feminine form that clearly are a great fascination to him. There's a lot to explore in looking at how styles have been adapted across time. Above you can see the two tier gallery layout with models encased in the higher area. Below in the left hand picture a series of romantic looks with historical overtones recall the era's of Charles II and Louis XIV complete with flowing wigs accompanying the ruffled coat dress. A fantasia in white this hyper romanticism takes the wearer and the viewer on a journey to another place. A medieval European courtly air is conjured with two veiled models wearing ivory lace dresses with an abundance of fabrics falling down the figures like liquid enveloping them. 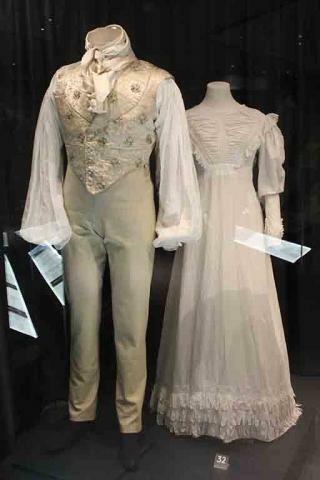 These are outfits for the red carpet or to be adapted perhaps to wedding pieces as a commission. 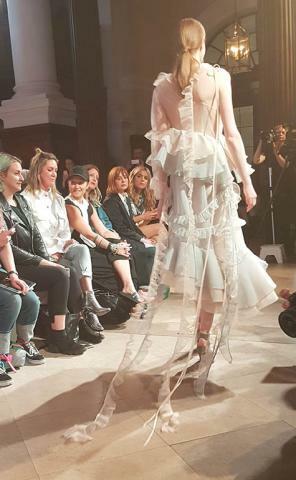 The ruffles of the white lace dress with veil behind hint at the back the stand looks ghostly and ethereal with a sense of detachment from the world around. Almost reminiscent of a dolls dress it keep the wearer hidden from her environment. 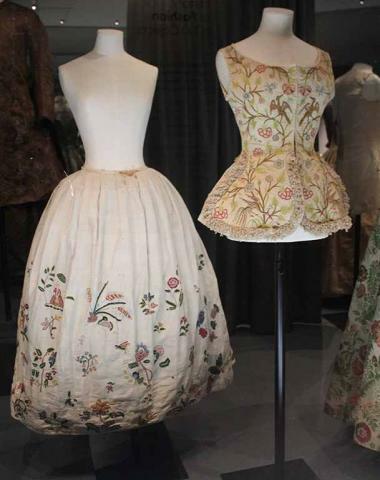 To the right an apronned pinafore dress with a veil descending across the shoulders brings abstraction once again to the norms and conventions of dress in earlier centuries. and antique looking clothes giving a strong impression of channelling the past while looking to create an aesthetic that seems entirely modern. Play with texture and textile offers acres of scope for Kawakubo evidently with ruched swirls atop of ribboned lengths, rippled layers and wrapped variations of the traditional kimono. He also seems to have a particular preference for showing women in pairs, like twins, perhaps evoking ancient superstitions of the mysterious powers of women born in twin parings. For me his 'in-between' that titles the exhibition means the past and the future as for me it seems to be the blend of different points in time that he is most overtly exploring. This is fashion to wear with a white painted face and a theatrical wig. 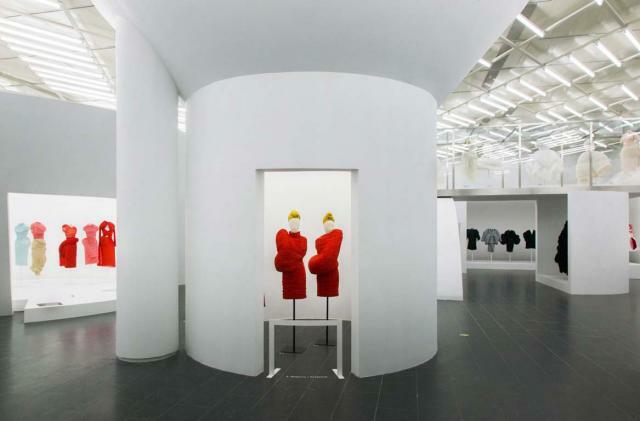 Hiding perhaps the real sense of yourself within Kawakubo's fantasies and construction. It's undoubtedly fascinating and well worth a visit if your passing through New York before 4th September 2017. 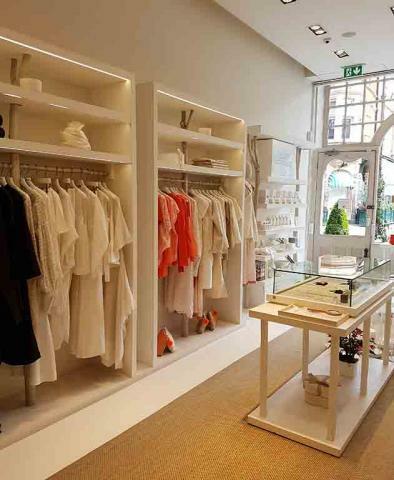 It brought a smile to my lips when I saw that wedding dress designer Sassi Holford had moved to a larger boutique on the Fulham Road in South Kensington home to an elegant understated neighbourhood of designer clothing boutiques and antiques shops. 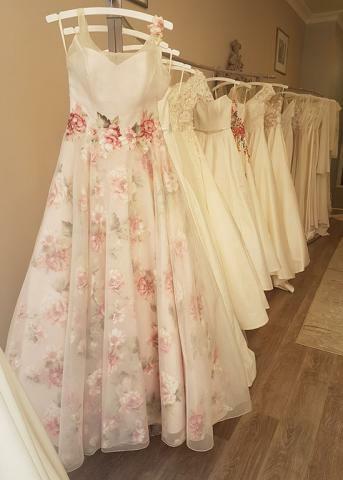 I find Bridal dresses and absolute pleasure to look at. It's such a special part of the fashion industry that touches so many lives and uniquley brings so much joy to the wearers. 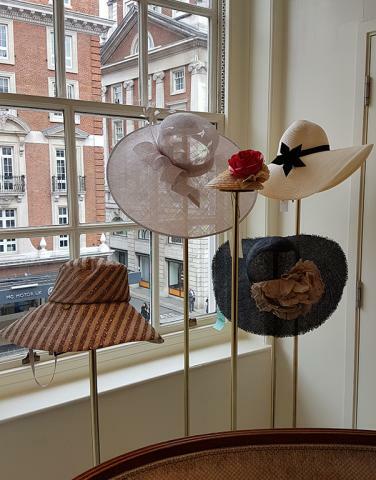 still leading the way in fashion and millinery for over 300 years in St James' London. 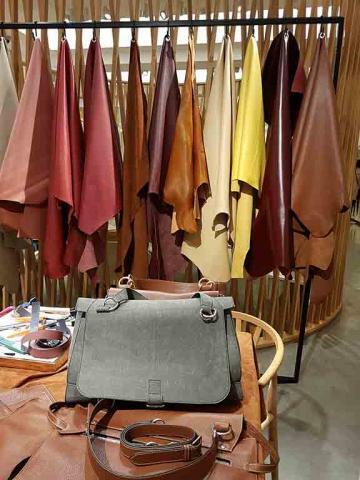 At the Mulberry flagship store on New Bond Street I spoke to member of the Somerset team Harrison who makes the signature leather goods and accessories so loved by clients around the world. 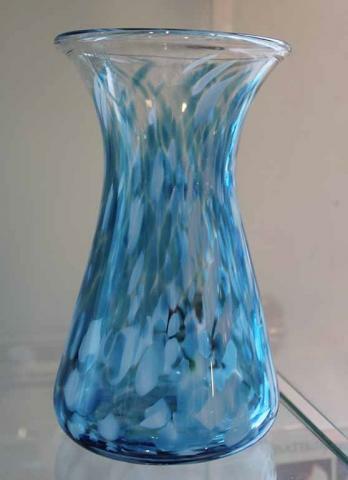 You can see him in the pictures below showing part of his role as a product design specialist at the Somerset factory. From time to times he also gives guided tours to visitors who are highly impressed with the technical skills shown by the team at the factory. 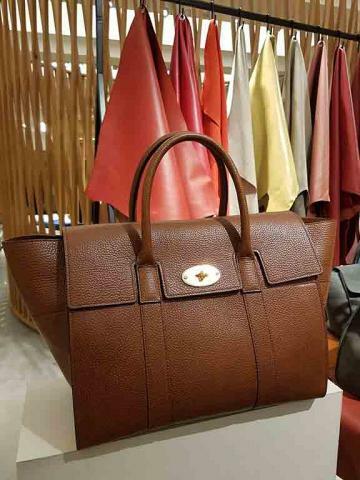 On the model that he put together in front of me Harrison said the new Bayswater now also came in medium size and that the pockets had been moved round to the front of the bag. 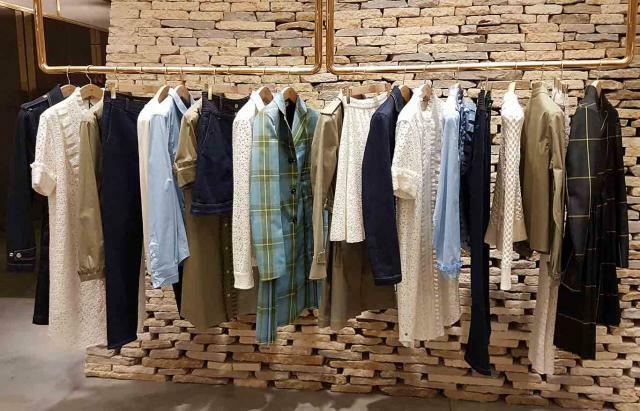 Such tweaks illustrate how the Mulberry team and Johnny Coca, Mulberry's Creative Director now 18 months into the job, have 'open ears' and listed to feedback as well as taking a fresh look at the products that they make to see where innovations can be made. 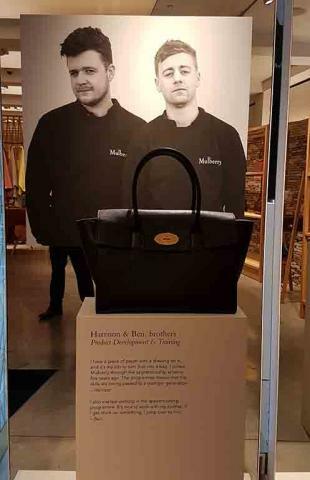 The process of creating a Mulberry bag takes around 9 months from first initial sketches to establishing an up and running production process. 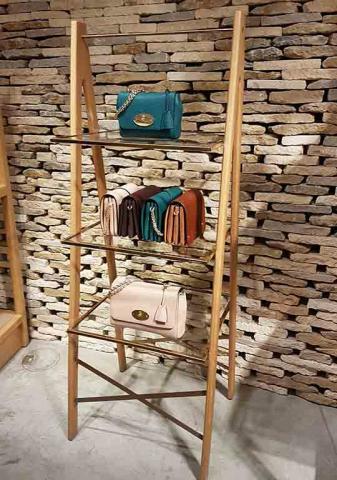 Mulberry are looking to develop their begs further and have many plans for new lines although they remain a guarded secret for now. On Mulberry's website you can see a video featuring members of the Somerset team talking about how proud they are to work on the pieces that are treasured by the clients of the brand around the world. This dedication and pride is vital for a heritage brand to retain it's commitment to quality and to keep it's place as a British brand. With a dynamic range of ready to wear designed by Johnny the brand is continuing to channel the traditional 'Lady of the Manor look with a 21st century outlook. She's a lady of our times and from any part of the isles with embroidery, linens, and tartans all neatly sitting beside her in the walk in wardrobe style offering below. 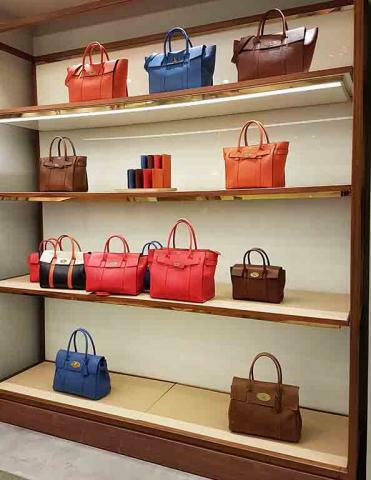 Mulberry is in an exciting new era and it's a very interesting time to watch and wear it's progress. Above the inner frame and compartments of a Mulberry Bayswater in Medium size before it has been finished. The work bench was kitted out with tools and constituent parts of the bag such as zips and lock plates, some recognisable, others not. Prototypes are cut in fabric by a computer that check that the designs are workable and then sewn together in 3D. 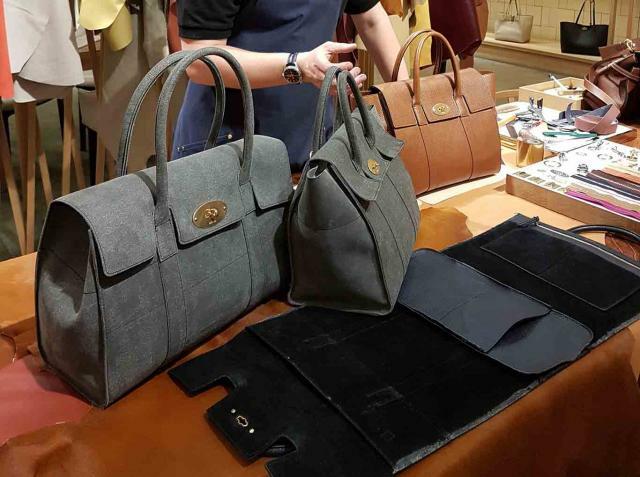 The production process involves 4-5 meetings between members of the design team and Johnny Coca, they meet him in London for hands-on appraisals of the bags at their current stage and it's very much a two-way process with the Somerset team giving feedback on what the teams seasons craftspeople make of the production process for the pieces. 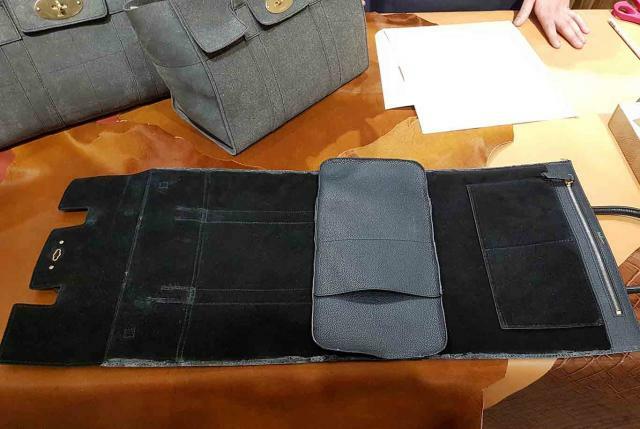 Johnny updates his sketches and other versions of the bags may be made depending on the team's opinions. The team as a whole are very mindful of production when thinking about development of products. The Somerset team is almost 700 strong with many members of families from the local community working there such as Harrison and his brother Ben seen above. It's a community employer that's teaching skills and giving life long careers in the South West. 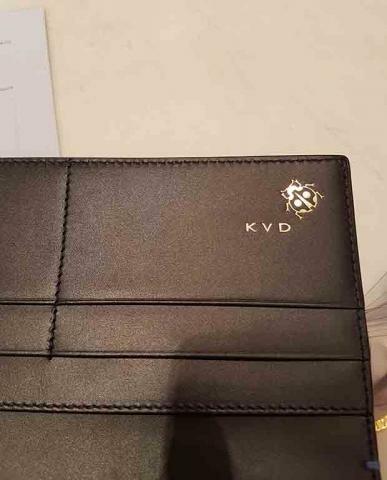 They also have some leather goods specialists from Italy working the team to give an extra dynamic but essentially day by day, about 236 people work on the production line with a specialist skill set. 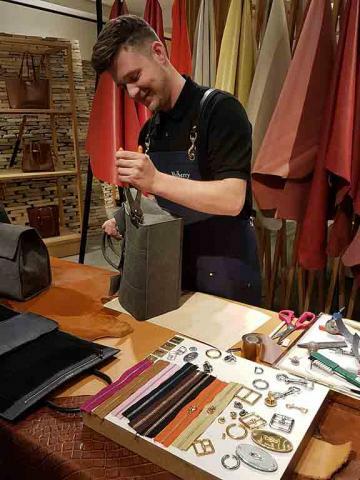 Each team member has 8 minutes working on a bag and all of the Mulberry bags are individually created bespoke pieces. 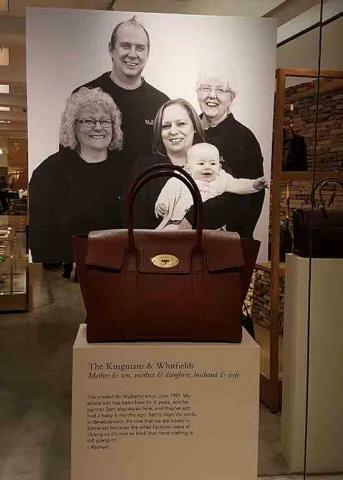 They create around 2500 bags in a week in total that are sold all over the world. The team work 2 seasons ahead on designs with Johnny so as we're looking in store and on-line at the current range, a whole host of exciting surprises are awaiting us in seasons ahead. 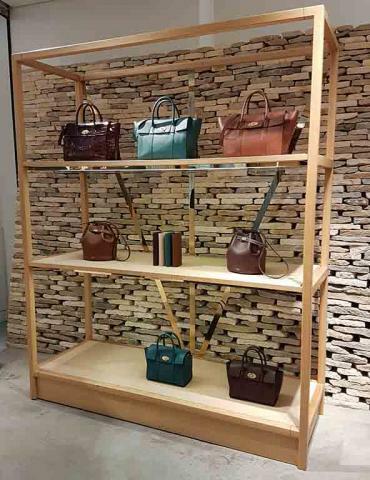 If you look carefully at the New Bond Street store amongst the bags you also have the dry stone wall of Somerset stones that take you back to the heart of the country where the brand was originally born. Bamford was created by the extraordinary Carole Bamford who has both masterminded a large scale organic food production and retail business from the families farming base at Daylesford in Kingham, Gloucestershire and created one of the most desirable sustainable luxury fashion brands in the country. 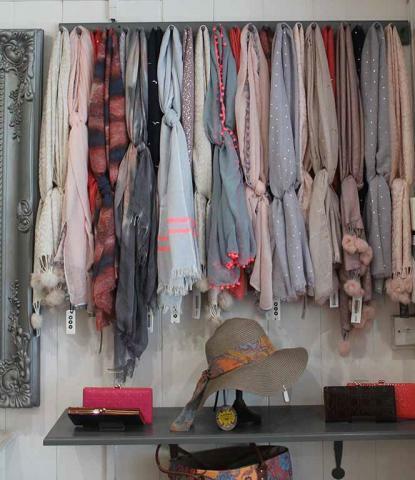 Most women who know their brands and adore cashmere would love to have Carole's pieces in their wardrobes. For London Craft Week they suitably got back to basics with a display of Scottish knitting techniques at their London Craft Week drinks reception that brought into focus the story of Bamford's artisans and team. 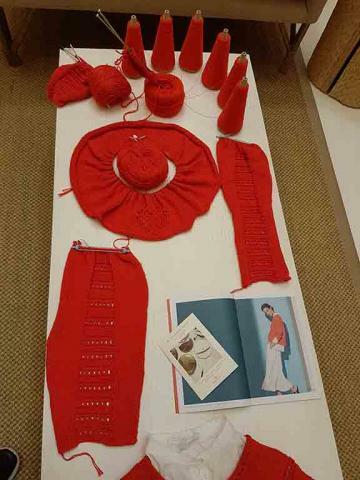 The party featured a demonstration of knitting techniques to use with Scottish cashmere yarns. Above you can see a selection of chosen handmade Scottish garments Carole, or Casie as she's more often known, understands that people want to have a relationship with their brand and an understanding of the 'where and how' behind the products that they buy. 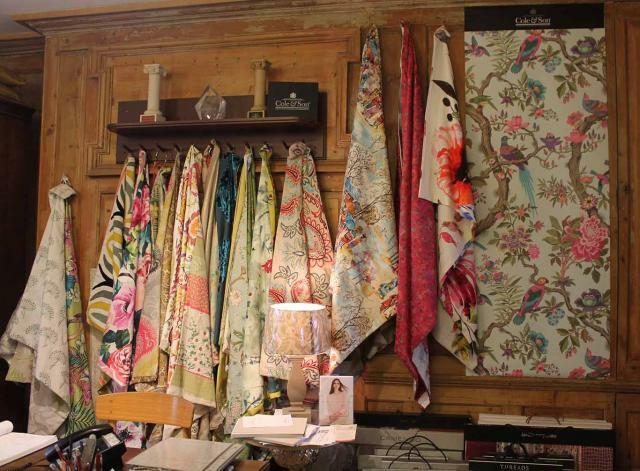 Walking into her store on South Audley street in Mayfair really does feel like you're walking into a haven. Supported by body and skin care products Carole has put together an entire lifestyle concept that is grounded in a belief that a natural approach to luxury is the best way of ensuring quality. 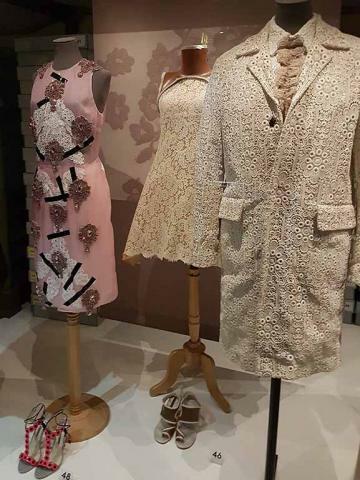 Also displayed was a curated range of Scottish knitwear pieces selected by Carole to highlight the firms commitment to maintaining traditional craft. The Bamford team where on hand happy to talk about the company's dedication to the processes of designing and making and it's very clear that this is team that hires people who really share Carole's passion for her art. 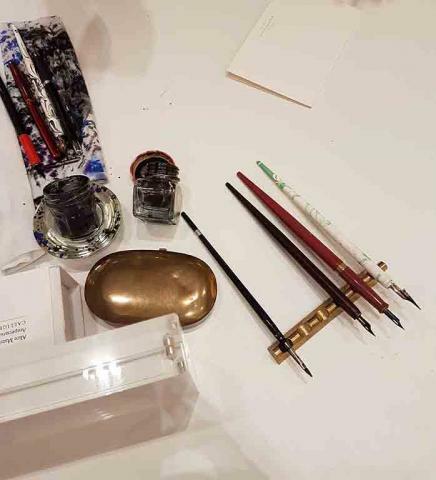 Smythson of Bond Street is possibly one of the most well known stationers in the world and there is a wealth of artisanal craft behind the process of creating many of their products before we even come to the beauty of the words that flow on the page. 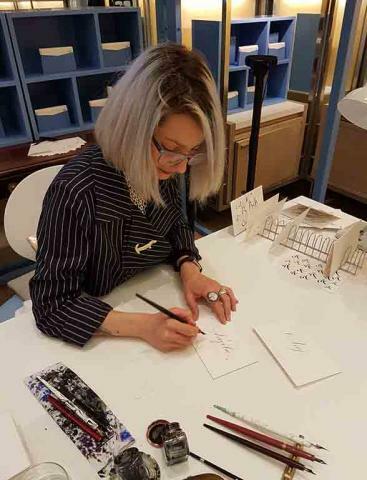 Calligraphy is one of the most treasured expertise around the art of producing beautiful stationery and it's one that we can learn for ourselves to make letters and invitations more special day by day. In past generations everyone wrote like this and I recognised my grandparents handwriting in the caligrapher's script. I watched as a curling 'Angela' appeared on a beautiful crisp cream-white envelope that reminded me of birthday cards and letters I received in the past. 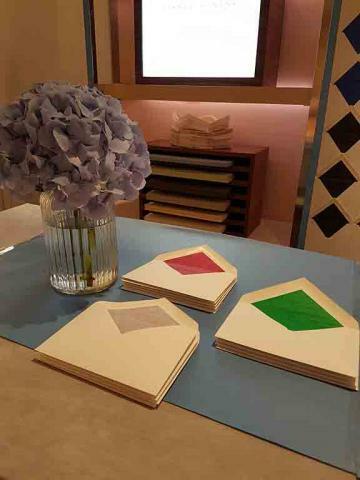 Smythson always have the most fantastic displays imaginatively playing on the shapes of the objects they sell. 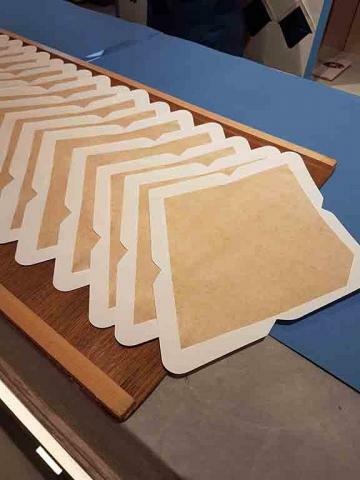 Above the 'envelope wall' was a pretty and simple way to make something you think you know so well suddenly transform into something very different, a literal piece of art. The beautiful tissue-lined pouches are one of those simple timeless designs that bring back so many memories of childhood letter writing. 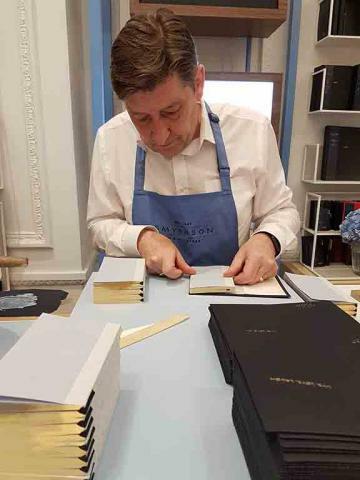 It's also another skill that is crucial to preserve as with many of Smythson's products there is a crucial human element of care in the checking of the production process that can never be replicated by machines. 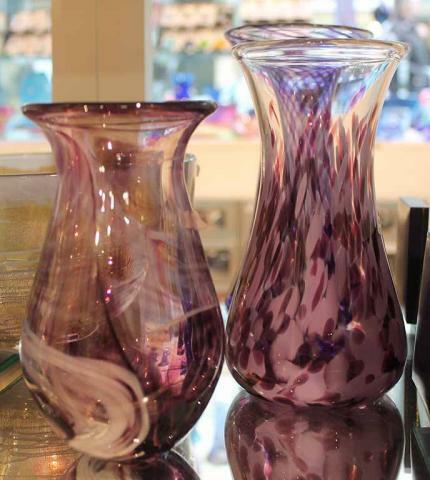 In several areas of the business they have tried, with state of the art equipment, in recent years but have always reverted to hand production and hand finishing. 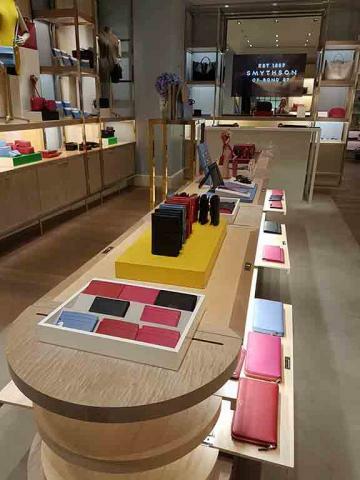 Smythson offer a world of choices of stationery and leather-good accessories from leather wallets to bureau's and make up, cosmetic and travel bags for him and her. 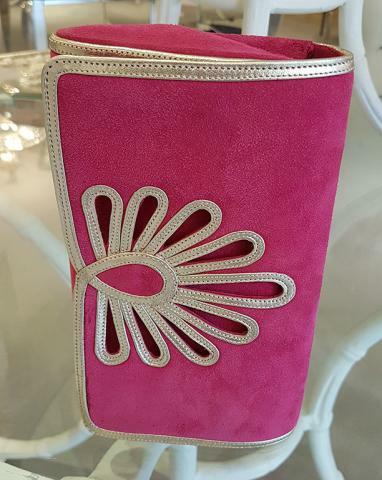 let's not forget the gorgeous range of handbags that you can see at the front of the boutique. 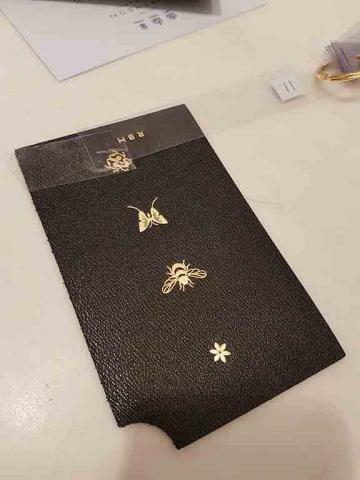 Engraving is such as special part of the process of choosing a gift or something for yourself. The master engraver not only applies monograms in gold leaf but has a wide range of motif to place on pieces to make a beautifully crafted item become extra special. One of the meticulous processes that proved machines couldn't replace people for Smythson was the binding of the famous Smythson notebooks. It requires a careful eye, a steady hand and a special glue recipe. It was so delightful to be able to hold one of these with the inspirational motto placed on the cover. Live, love, laugh, I think it sums up Smythson well. Founded in 1887 it's been helping us record and celebrate special moments for over a century and hopefully there's many more generations to come in the future who will enjoy their products too. 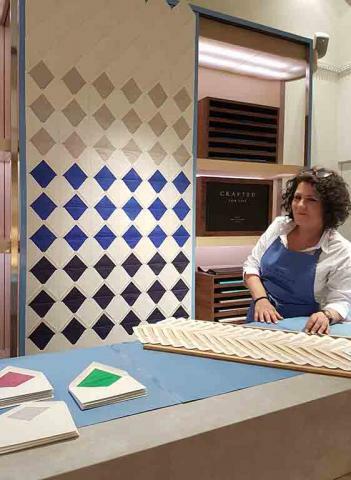 London Craft Week will return on the 18th May 2018 so make a date for your diary if you're going to be in town. Top of my wish-list, this purse by the fantastic Suzannah. He hat's women and girls of all ages to perfection - William Chambers. 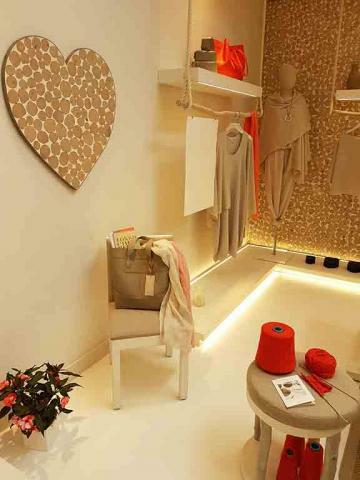 A booth showing clothes and purses by Suzannah with hats by the ever so talented Rachel Trevor Morgan. 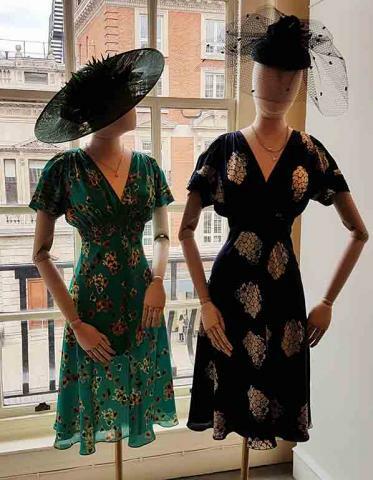 On the second floor of Fortnum and Mason across the hall from some of the finest china and picnic hampers that you can find in world and a delightful traditional perfume bar sits by a beautiful women's wear gallery specialising in occassion-wear. 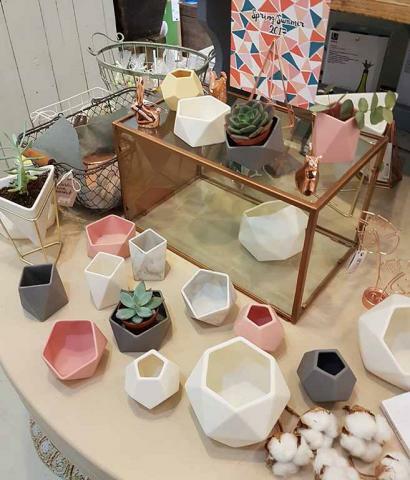 I popped along as they unveiled their Summer showcase for The Season and caught up with my friend William Chambers and narrowly missed the fun and amazingly talented Suzannah Crabb herself for another chance to chat. 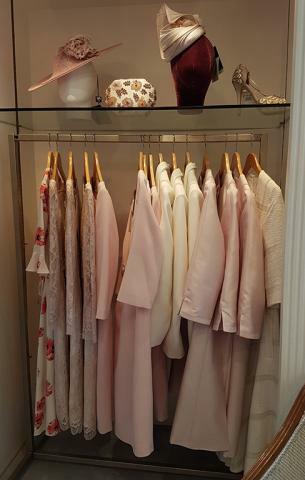 So with a plethora of events on the horizon be they formal like Ascot, Henley or Gala's or alternatively you will probably have some weddings and summer smart drinks and dates to go to as well this requires a wardrobe kitted out with options. Plus it's good to be prepared for last minute surprises. My motto "if it makes your heart race, buy it" because I think it's a sure sign that something will come in very handy for you in the future and prove to be canny choice. 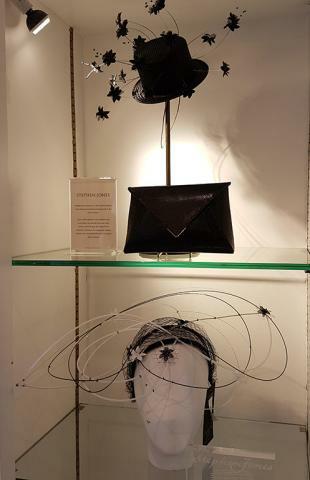 Hats by Vivien Sheriff and purses by Suzannah. Some magical hat and purse duets from Stephen Jones. 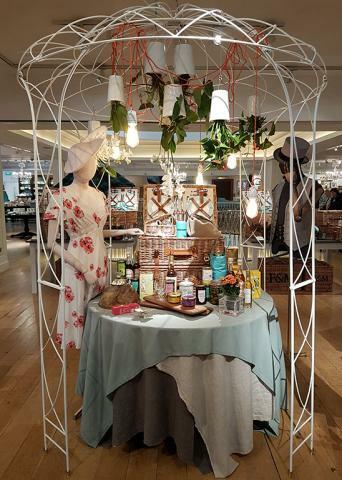 A dream Fortnums' picnic; what to wear? A hat from Vivien Sheriff and dress from Suzannah of course. 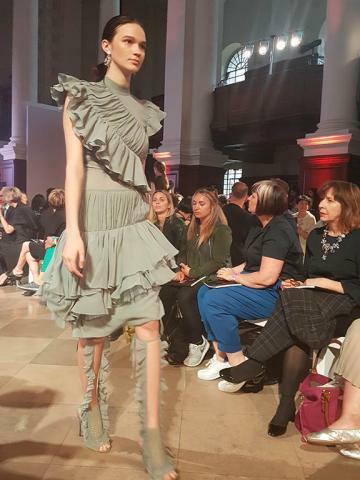 As regular readers will know I think Suzannah Crabb is one of the outstanding designers for formal day wear that we have in London at present alongside contemporary greats such as Stewart Parvin. Her work sits easily alongside Rachel Trevor Morgan whom I gather from our conversations Suzannah collaborates with to coordinate outfits for her private clients. To the left a look at some of the pieces that I saw in her beautiful Quebec street boutique displayed with a perfectly matching Vivien Sheriff hat and own-brand clutch purse. The shoes are from Emmy of London. 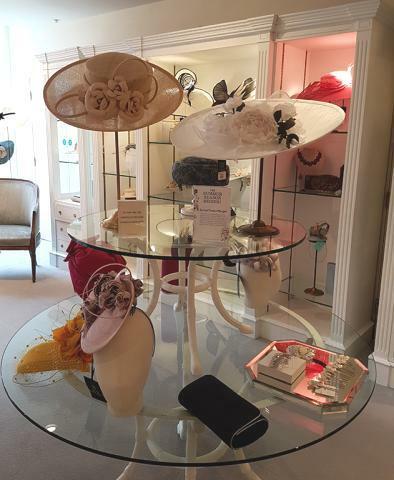 Hats from Vivien Sheriff and dresses, coats and purses from Suzannah fashion. While it certainly never went away in recent there has been a resurgence in interest in the program of social events that has been known as The Season since the 18th century in London. Traditionally this round of balls and parties served two main purposes. It allowed aristocratic and wealthy families to reconnect when they came back to London in the Spring and early Summer from their country estates and also crucially this social melting pot of the upper class formed the basis of the semi-formalised marriage markets of the day. The debutante's 'brought out' by their families in London at a series of balls and parties where 'under starters orders' to find or be found a husband and young men looked to catch an heiress. But it wasn't by any means the only way that people found partners, not all marriages where arranged and love matches did often happen; for many this was part of the traditional round of life. 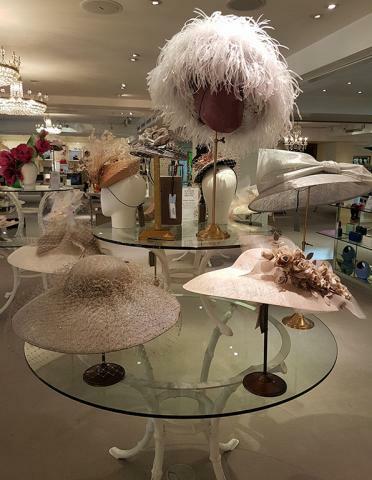 Quite a history flash back there but standing in Fortnums you have the sense amongst the contemporary collections that a lot of what is now history found on the pages of novels such as William Thackary's Vanity Fair really did pass through it's halls. 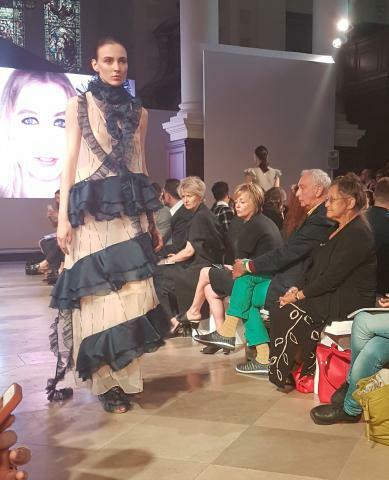 But time doesn't stand still and Fortmun's take fashion very seriously engaging with leading contemporary designers who show at London Fashion Week and/or dress leading figures in today's society whether they are in the public eye or very private and discreet. The season now is, as ever about dressing your best and having a good time. Making memories with friends and family and looking your best. Fortnum's take millinery very seriously and I was very lucky to be introduced by William to their own in-house milliner Adrian Philip Howard. 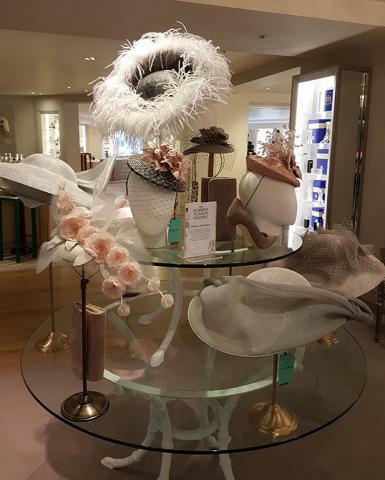 Year round it's Adrian's mission to make sure Fortnum's keeps up to date and ahead of trend in the hat world as he produces his own line of headpieces for the store as well as advising on who they should stock. This area of the second floor is known as the Sense of Occasion area. 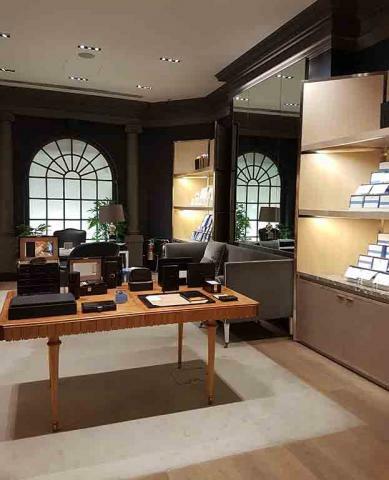 It's a typical touch of Fortnum's charm and the area feels welcoming set out like a walk-in dressing room rather than having any feeling of being forbidding or formal. Here you're looked after by sensible designers who understand that you're on a style mission in most cases and need some sensible advice and options to try, there's no cool formality. 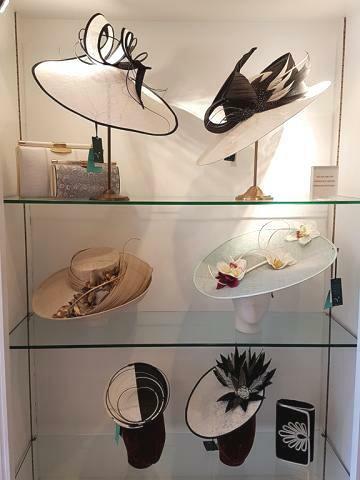 Another view of hats by Rachel Trevor Morgan and purses by Suzannah. 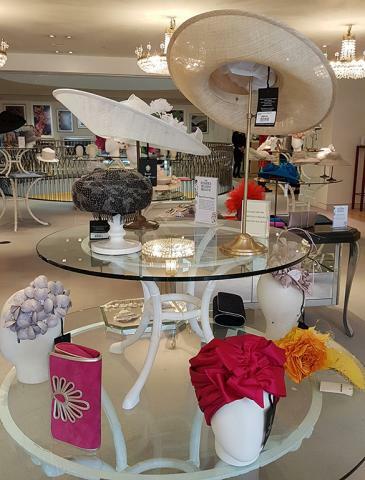 Another view of hats by Stephen Jones and purses by Suzannah. So there you have it. A peek at how this, probably one of the oldest department stores in the world is quietly and discreetly also keeping up it's place as a fashion spot that you should have on your map. Fortnum's wouldn't be complete though without it's extra special touches of magic. 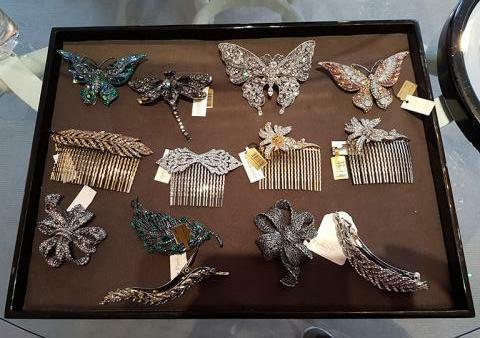 Below right you can see some of the many beautiful jewelled clips on offer to keep those well tended locks in place. A special secret to keep under your hat. 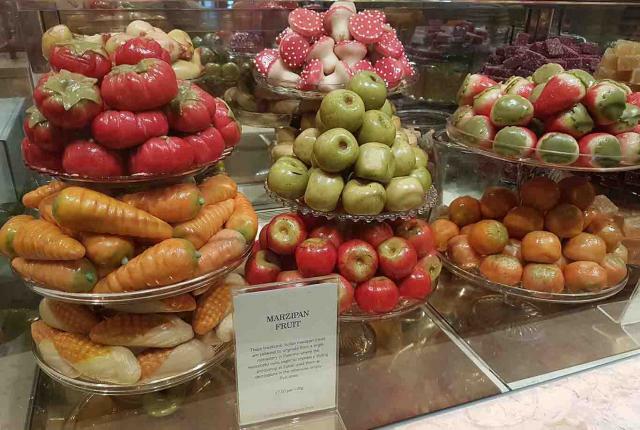 And below right something from the food halls - a real Fortnum's speciality giant fruit marzipan's. They really are huge and you'll only need one. but the hot days of summer they're a perfect treat to wrap up and slip into your bag in case you need a quick burst of sugar. I've repeated some looks here through sheer indulgence in this piece as the detail and beauty of some gowns was too much to see only once. 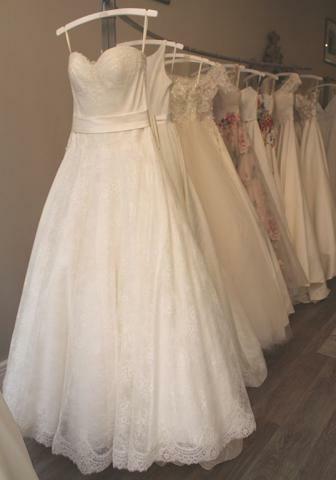 Interestingly many of the Bridal pieces take the form of dresses that can also be worn as floor length gowns. 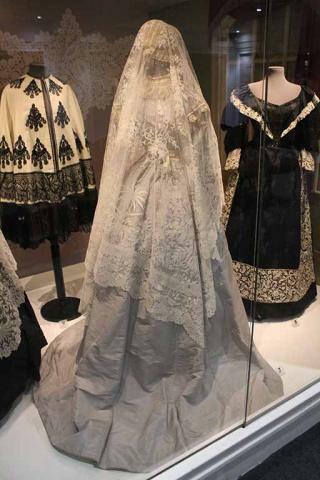 In another era brides also continued to wear their wedding dresses as evening gowns and for balls and many of these looks are just asking to be taken out to dance and twirl in a ballroom. 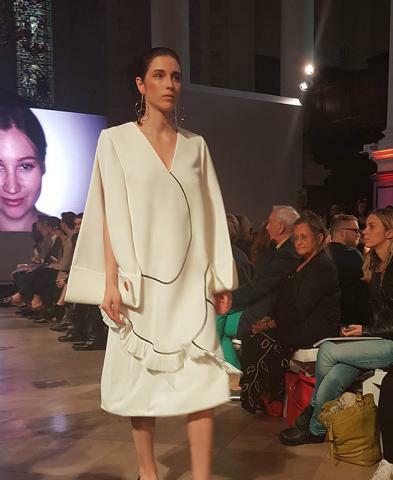 The Marangoni Institute London Graduation show in Spitalfields, London. 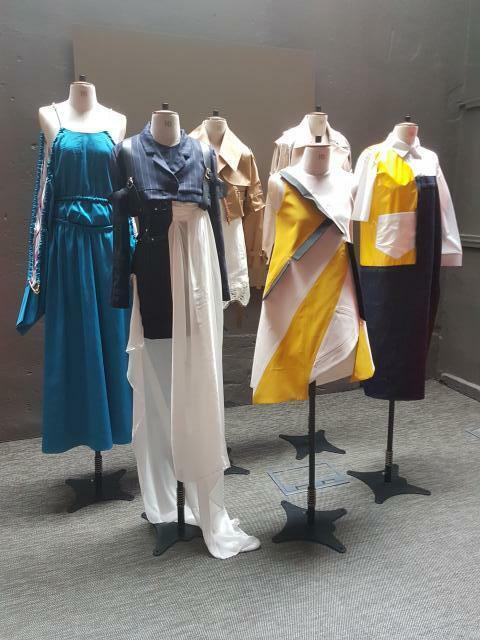 London is blessed with a profusion of Fashion Schools now that means the much awaited annual Central Saint Martin's Graduate show is now part of an entire Graduate Fashion Week in London. Buyers, journalists and industry sages flock to London to see who and what may be coming up in the next few years. to her studio in Chelsea. Her fashion repertoire extended to evening gowns, day suits, occasion wear and also her noted bridal wear. Always remaining low profile during her 30 year career she and her team where focused on getting it right for client. Today the business still shys away from runway shows, and media and marketing campaigns preferring word of mouth to grow the business just as it began. 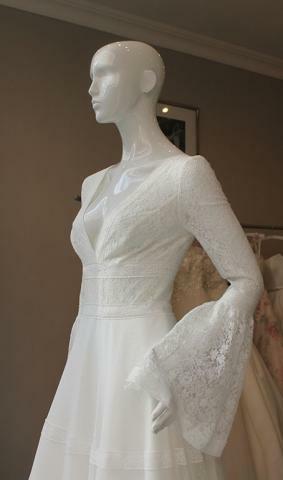 With high profile clients such as the late Princess of Wales who she created over 1000 dresses for working tirelessly, and the Duchess of Cambridge amongst numerous ladies of the British Royal Family to be dressed by Catherine and her team, she occupies a unique place for in the history of late 20th century and millennial British Haute Couture. The House style is demure, slightly formal without being crushingly dated and the atelier shows that they know how to move with the times. Balancing the needs of VIPs for Diplomatic Dressing (a term I think I first coined) and providing one of the best selections of Haute Couture garment options for both day and evening in the UK, it's a House with a strong identity. In a drawing room at Brown's the clothes seemed at home embodying timeless modern luxury. Detail is at the heart of their endeavours and Said's academic background in fashion provides a reservoir of knowledge to draw upon. In exploring the codes of Royal dressing that Catherine Walker helped to bring forward through the Millennium, there is a nod to the era of Queen Alexandra and Queen Mary in the late 19th and early 20th century. 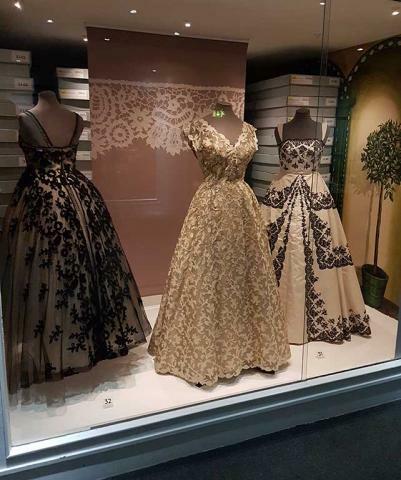 Said notes that elements of their style have shaped the way royal women dress today and also in the evolution of formal wear in general through the 20th century. 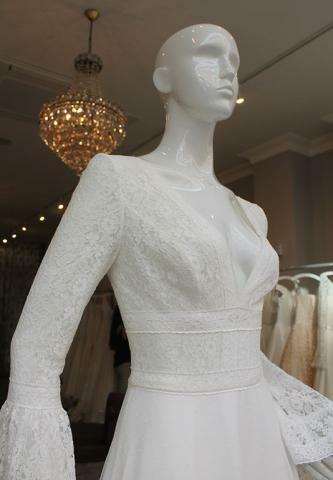 There have also been many subtle adjustments to bring the gown into the modern era. Keeping up to date, the new e-couture service allows clients to order garments in their size that can be shipped world wide and given final adjustments by local seamstresses. Catherine Walker is admired throughout the world so this is a welcome step to enable more women to be able to add the label to their wardrobe collections. Traditional techniques are cherished in an atelier run along the same lines as in those in Paris. It spans 7 studios in Bury Walk, a quiet corner of Chelsea. 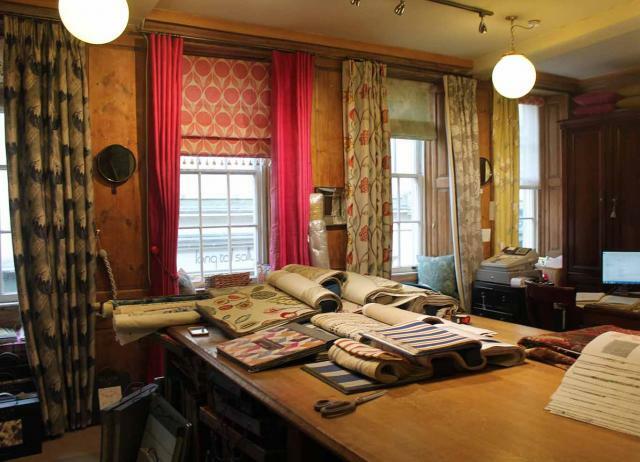 Separate areas are devoted to tailoring, dress making and the House has it's own specialist embroiderers who are some of the most skilled to be found anywhere. 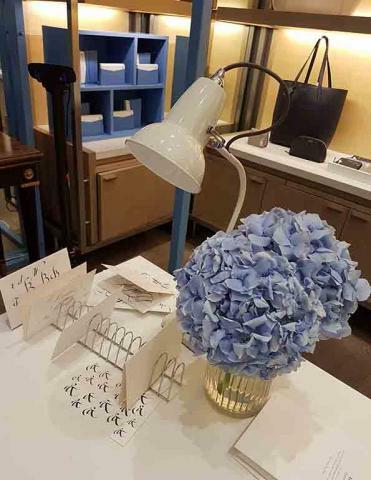 Client orders are made by a devoted and experienced atelier team lead Said himself has four decades of experience in the business. Before founding the Haute Couture House with his wife he lectured in fashion at Chelsea college. 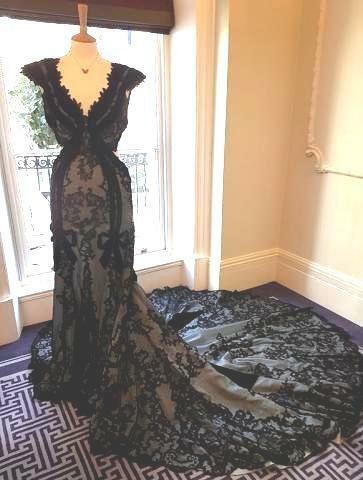 Above you can see an evening dress with train with beautiful silk overlayed with fine embroidered silk. 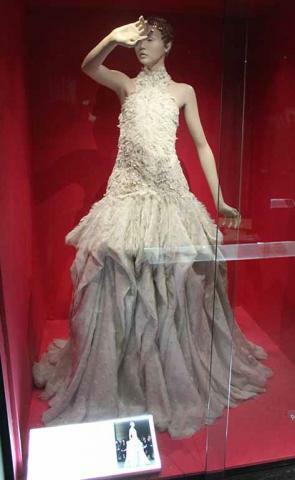 This is high glamour Haute Couture blending the past and the future and I believe may have been worn by Lady Gabriella Windsor in around 2007 for a benefit gala. You can see how it works beautifully with a statuesque figure. 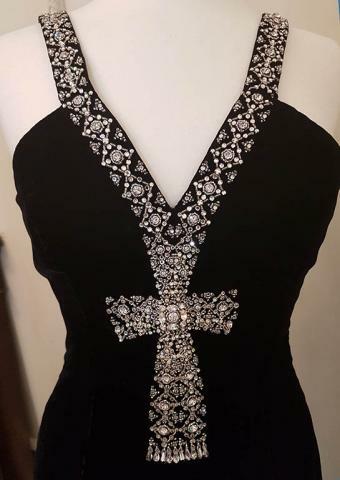 Above to the right a black evening dress beautifully accented with diamonte crystal embroidery transforms the idea of a simple classic piece into a stunning piece fashion that would be very memorable and hit the headlines if worn by a high profile individual. 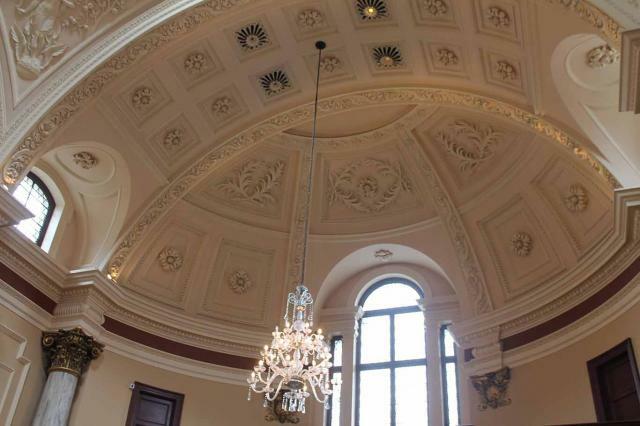 The detail is breathtaking and it's a style that's both timeless and would suit many clients. It could possibly be worn with a jacket, wrap or long coat if that would suit the wearers mood or environment too. If you're looking for a bespoke formal wear dress this is still one of the best places to come in the UK. 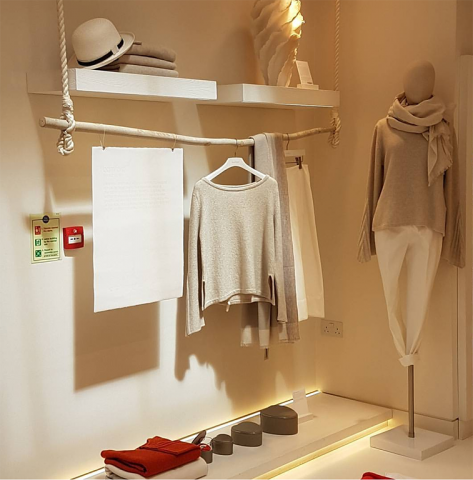 The new showroom offers an unusually large space for a South Kensington boutique, encompassing both extensive galleries of show rooms and fitting areas on two floors. 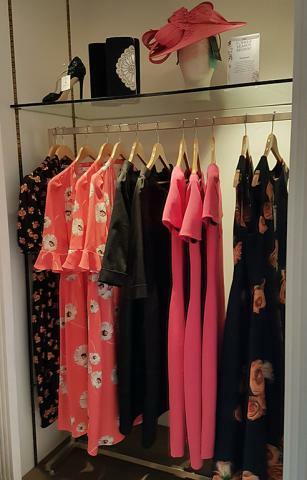 The larger area upstairs holds several collections and downstairs the second fitting room sits alongside the new collection of evening wear. 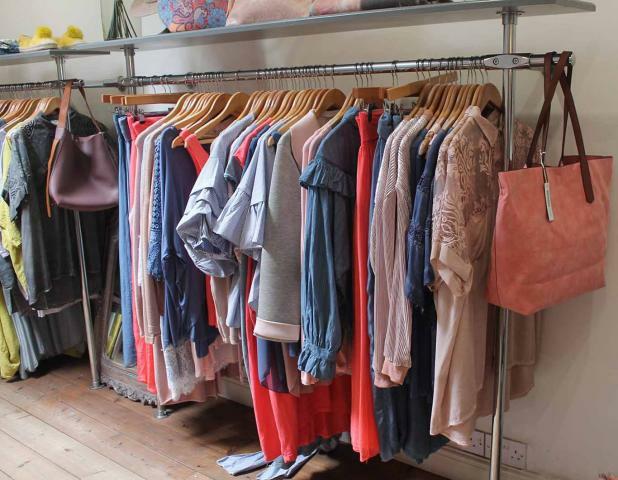 Based in Taunton in the South West of the UK the multi-award winning designer has boutiques located both there and in London with concessions across the UK, US and throughout the world. Sassi Holford offer several collections simultaneously with their award winning Twenty 17 collection sitting alongside many classics and the newly unveiled 2018 collection. 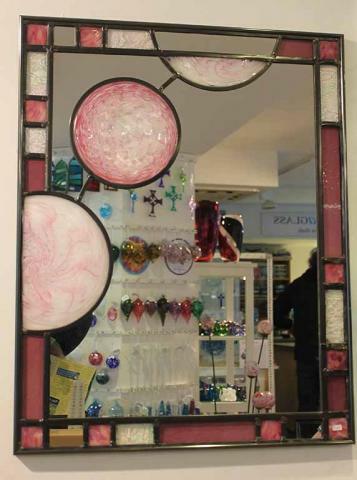 A portrait framed picture looking like a romantic mirror offers the perfect welcome. 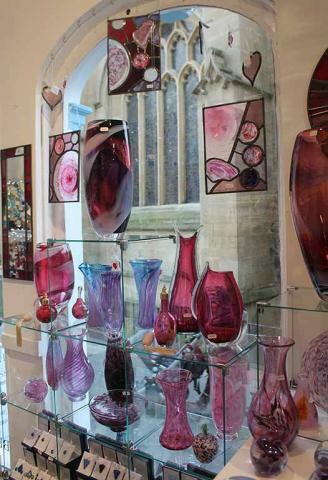 I felt completely relaxed as I began to explore the pieces on offer. 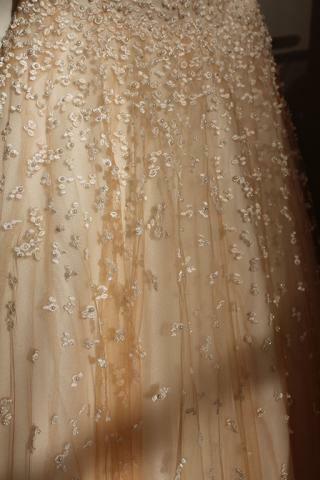 Above with rose petal detail is the popular Marilyn dress. Since Queen Victoria by legend began the trend for wearing a white dress, rather than a new day suit or long gown in any colour, the trend has held remarkably in place for almost two hundred years. 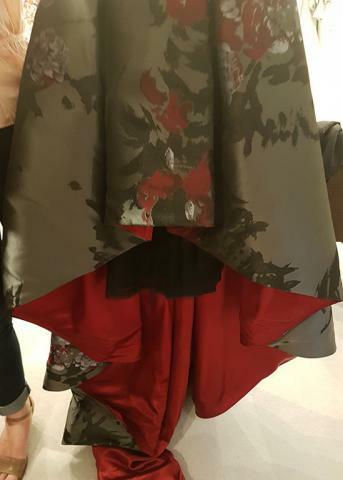 Shoots of change are coming through with several designers using colour more in their collections and this piece caught my eye as a special choice. 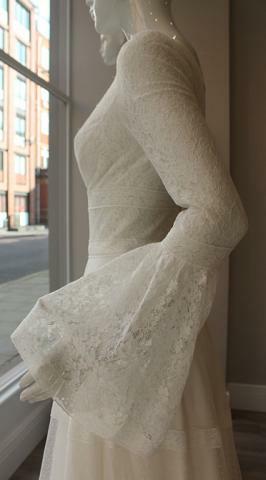 It would look equally beautiful in a ceremony as well as making a great dress to dance in during the evening. These days it's not uncommon for brides to have two dresses, one for the ceremony, often in the day-time and another for the evening. 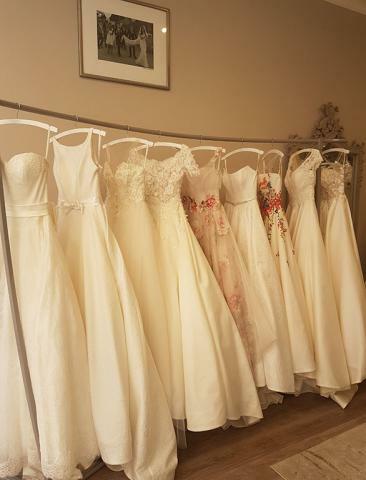 Standing in a room full of beautiful dresses this suddenly seemed like common sense rather than frivolity. There is simply so much to chose from that you probably will find 'the one', there are likely to be several 'runner ups' and that's just from looking at one designer. 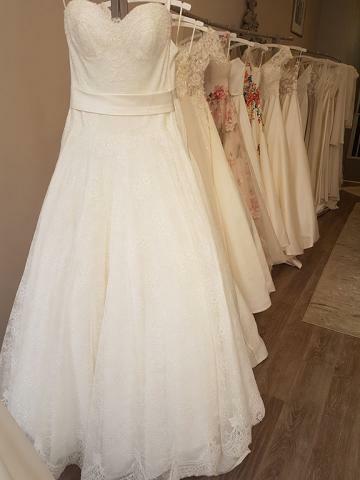 My advice to any potential brides would be to choose your dress early if you can and arrange the fitting around the other Wed-min. 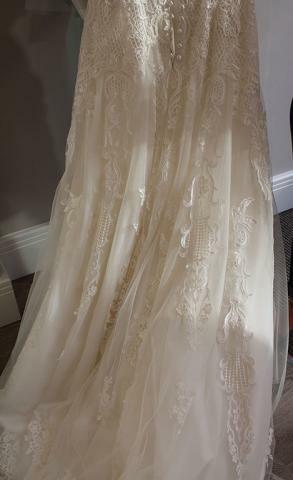 My friend designer Georgia Hardinge took a different approach and made her own dress two days before her wedding. As a professional with her own studio, Georgia was in a great place to do this but I would definitely recommend planning your dress as early on as you can. For me certain styles jumped out quickly and my final wish list choice was an instinctive one that Sassi's assistants also thought would suit me the best. 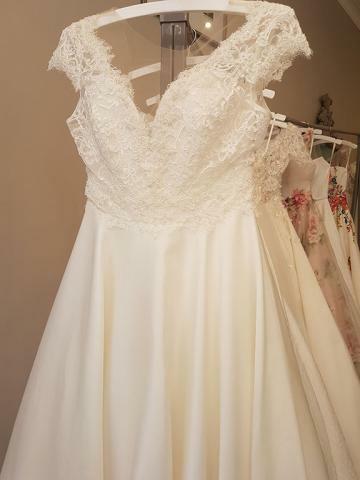 This season Sassi's team are exploring heritage styles and design with a look at traditional lace-making skills and their use in bridal dresses. 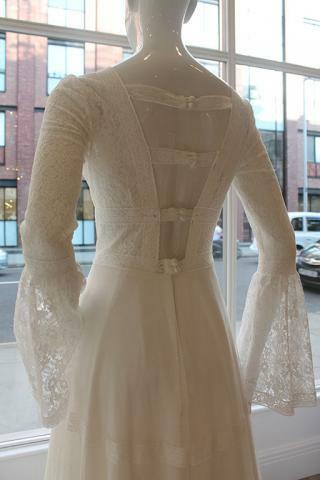 In the window two dresses the, the long sleeved Constance and shorter sleeved Henrietta use lace produced in Nottingham to show the gentle romantic hints that the craft has been adding to luxury gowns since the 17th and 18th centuries in the UK. It's a fascinating glimpse into fashion history as the lace makers of Nottingham where the forebears of the famous Chantilly lace makers who travelled across the channel to establish the craft in France aided by Anne-Genevieve Duchess de Longueville part the wider French Royal family. Lace can have a cooling effect if you wear it in the Summer, lightly protecting the skin and capturing the breeze. It's femininity defined and adds a traditional layer of mystery to the look. 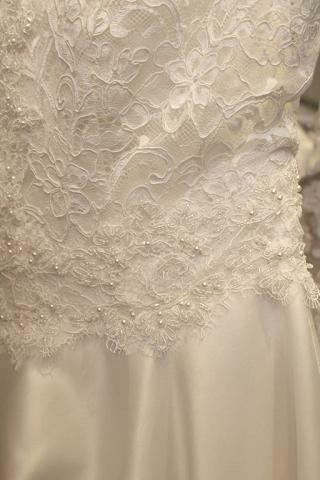 Lace trim also adds another interesting facet to the garment giving a heritage feel twist. Looking at these dresses from every angle there is plenty of detail to discover the while the delicate composition ensures that the bride herself is never 'over powered' by a design. 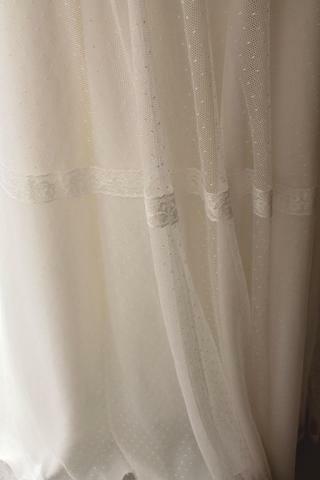 To the right a beautiful lace overlay of a dress from the Summer 2018 collection shows the light catching the detail beautifully. Again working through a vintage feel the lengths of this particular dress capture the romance of a bygone era and bring it forward into the present day. A rail shot from the Twenty 17 collection. 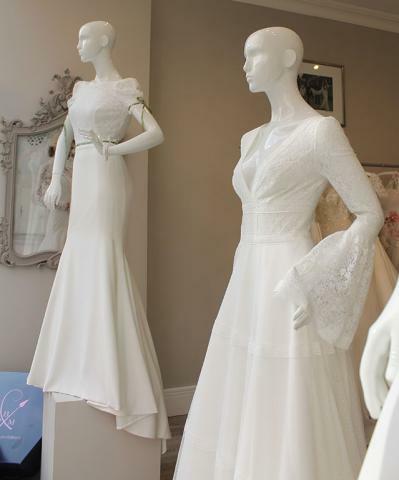 Sassi Holford has been designing wedding dresses for 35 years and she's still elegantly moving with the times producing dresses that look and feel special. The Summer 2018 collection takes a further exploration into colour with this apricot dress finely detailed with applique embroidery. 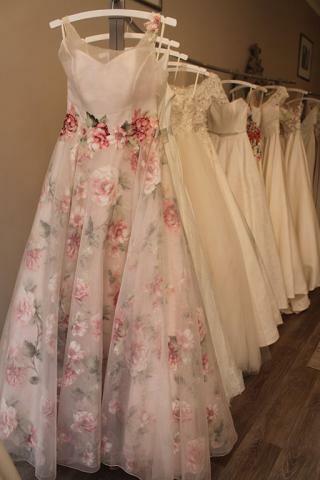 All Sassi Holford dresses are handmade in England by a team of cutters, seamstresses and embroidery specialists. 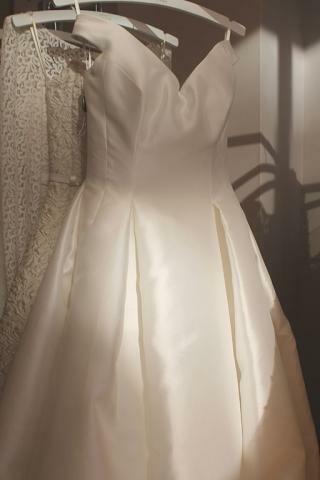 Supporting British craft and skills for me gives the brand an extra special something and it's a mark of quality that women all over the world chose when they are looking for their wedding dresses. 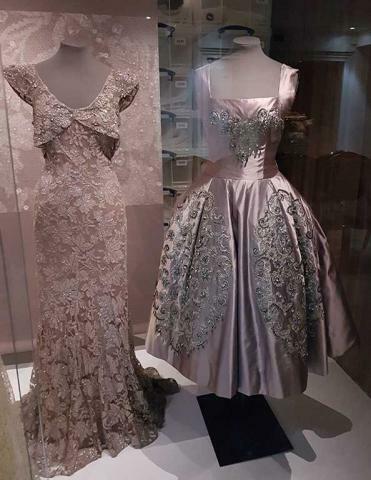 Above in the centre you can see a beautiful gown echoing the classic mid 20th century lines of formal wear and evening dresses. It's so simple and light in it's construction that it could suit many women. 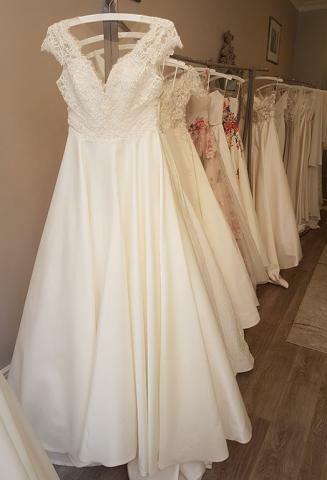 Amongst her selection Sassi also produces a pared down line of dresses for brides who would like a very simplified style that allows brides a blank canvas. 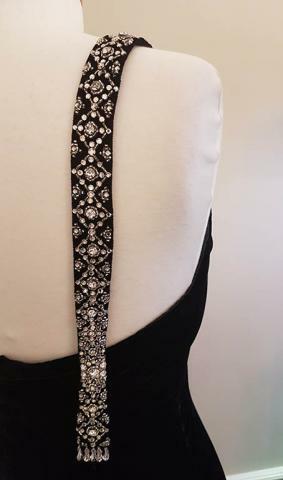 Attention to detail is very evident in the craftsmanship of the pieces and for garments that have the feel of a couture finish she's also quietly rather competative on price. 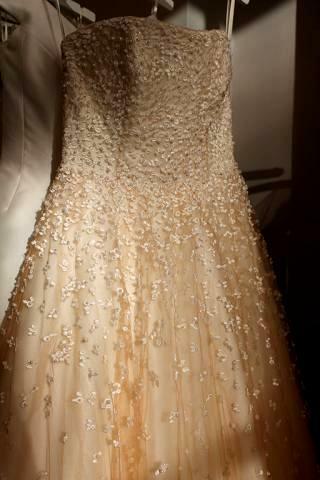 Every girl should be able to find a beautiful wedding dress for her special day and have her dream dress. 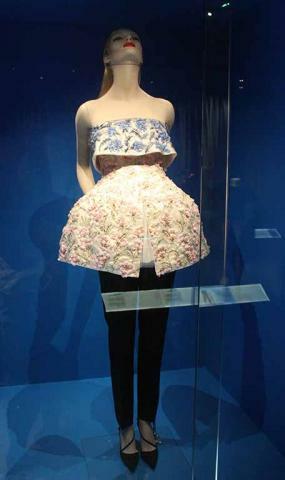 The opening of Balenciaga: Shaping Fashion at the V&A in South Kensington, London. A look at Swimwear to make a splash this Summer. 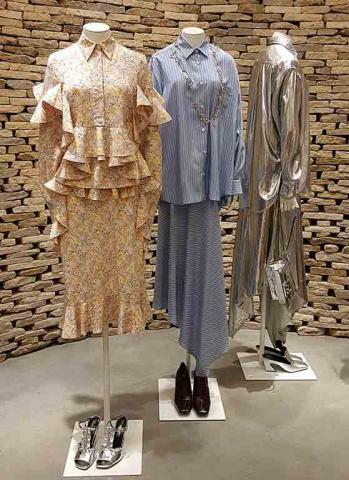 The Marangoni Institute London's Graduate show is one of the Hottest tickets in town though to be fair it's an absolute pleasure to be able to see the hard work and dedication that has been quietly achieved across the UK over the previous academic year. 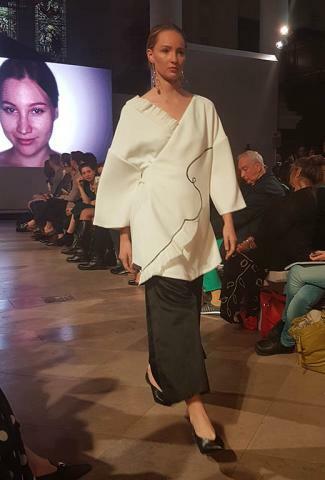 The Marangoni like all Fashion Schools in the UK draws an international body of students and they are turning out some very impressive clothes. 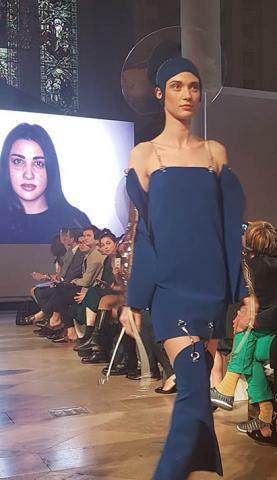 What struck me was that many of the designers didn't look at all like they where still in the 'embryonic' stage that you may expect for students newly graduating into the world of fashion. Quite to the contrary many look 'ready to go' and found their own labels or follow the path to go in-house and produce highly skilled work in the style of the Houses they go to. 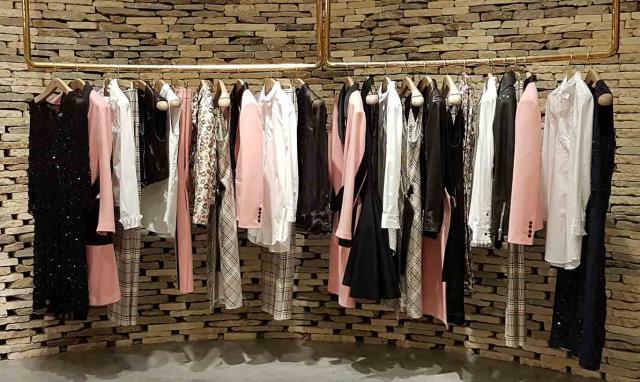 What was also apparent was the clear feel for contemporary luxury that many of the designers displayed having clearly set their sights on the luxury ready to wear market. For some, if not all, a showcase like this will provide a valuable first step on the path of their career. 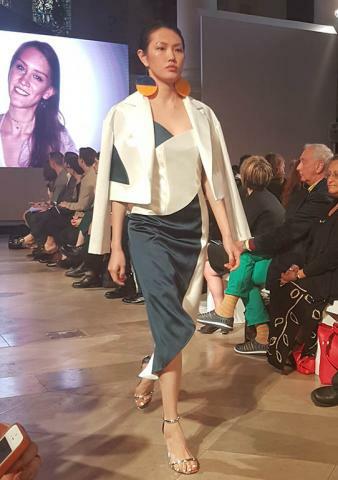 The diversity of the creative talent on offer was very evident with each designers collection coming out encapsulating it's own particular personality. There are the early roots of personal brand styles here that walked before us much to the quiet respect of the audience on this rather warm evening. 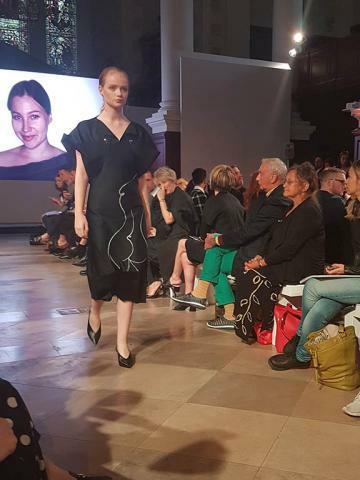 For me it felt like glimpses into 'fashion weeks' to come as unbeknown to us now, some of these young designers could have a great influence on our wardrobes in the future.